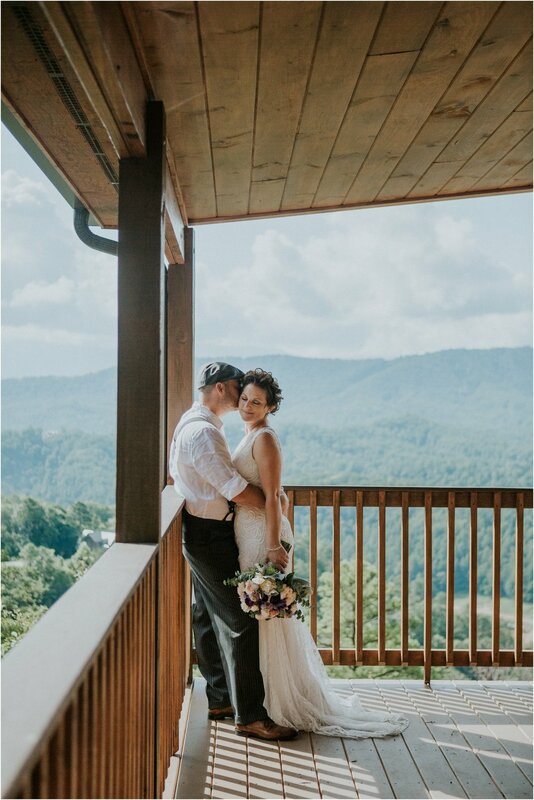 These two traveled quite a way to become husband and wife in our beautiful Tennessee mountains. 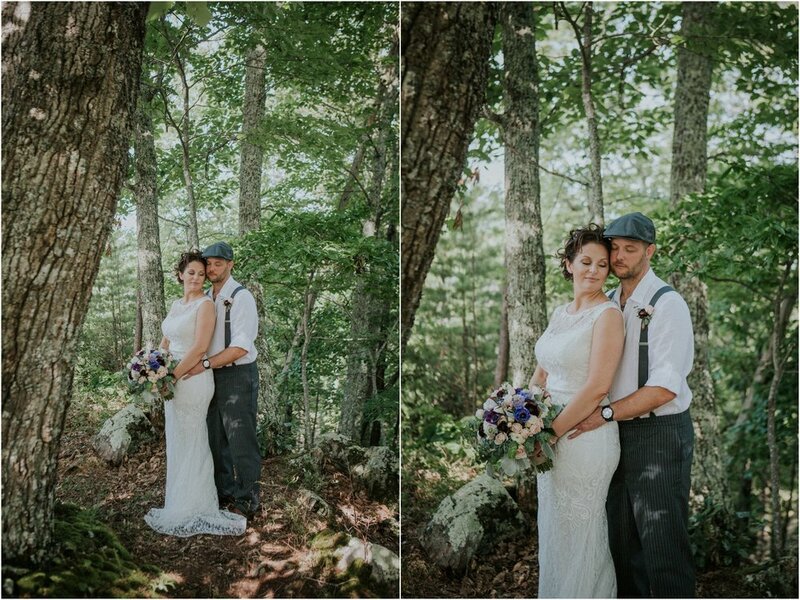 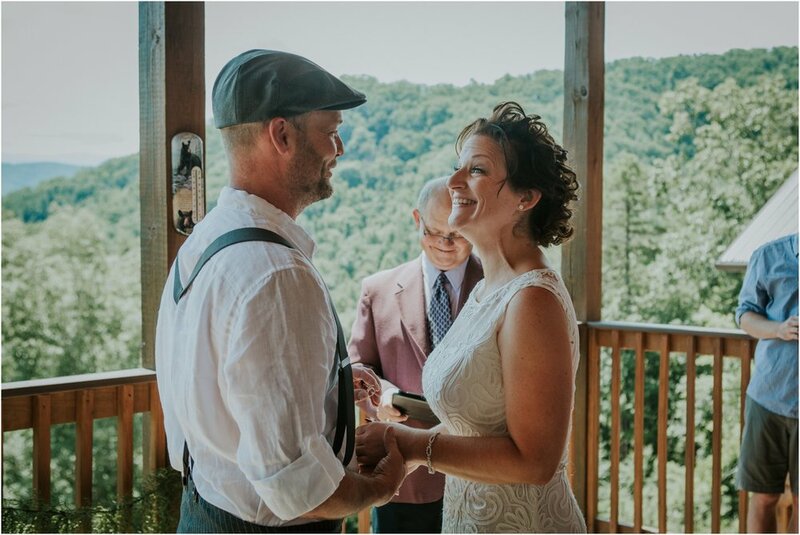 Stacy and Jason are from Michigan, but fell in love with the Smokies and knew that they had to get married there. 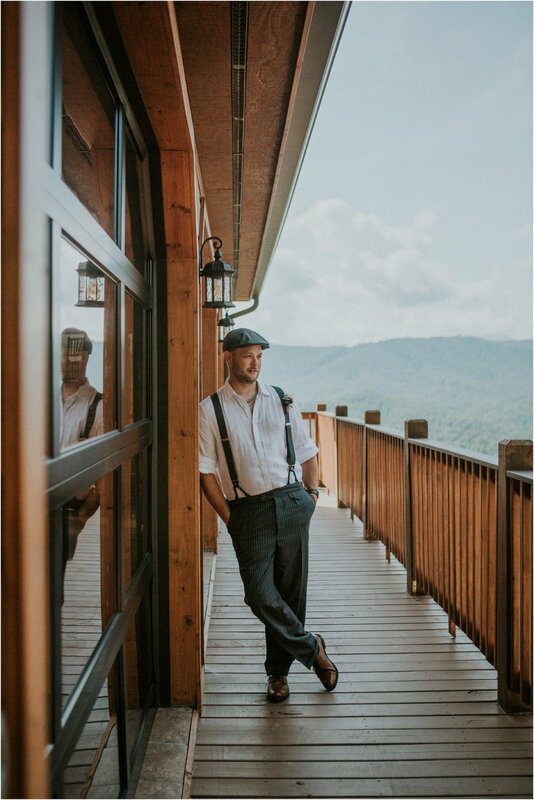 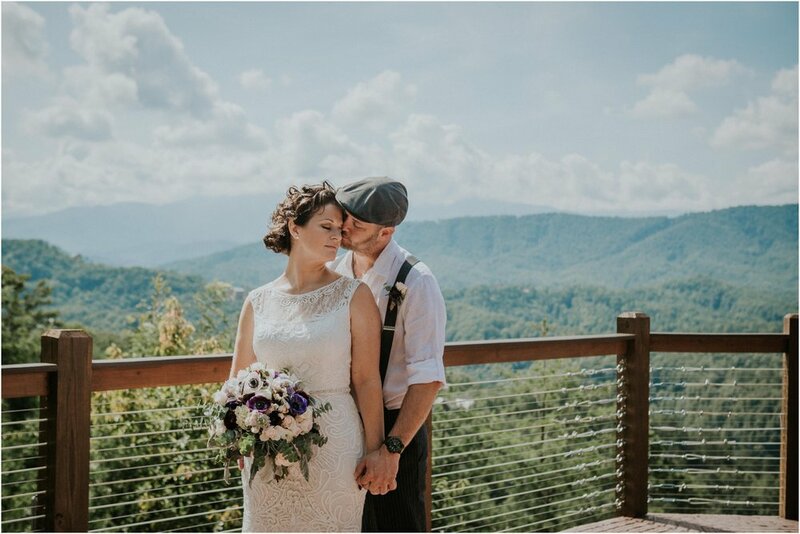 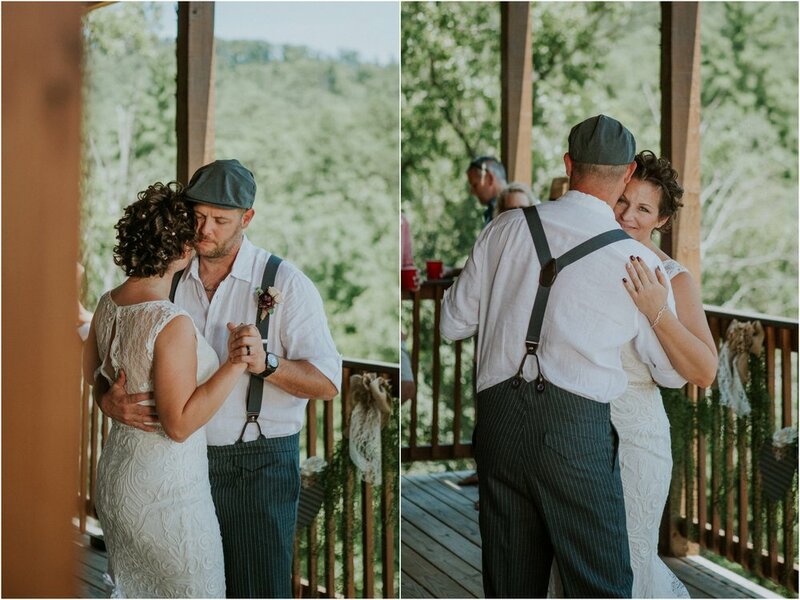 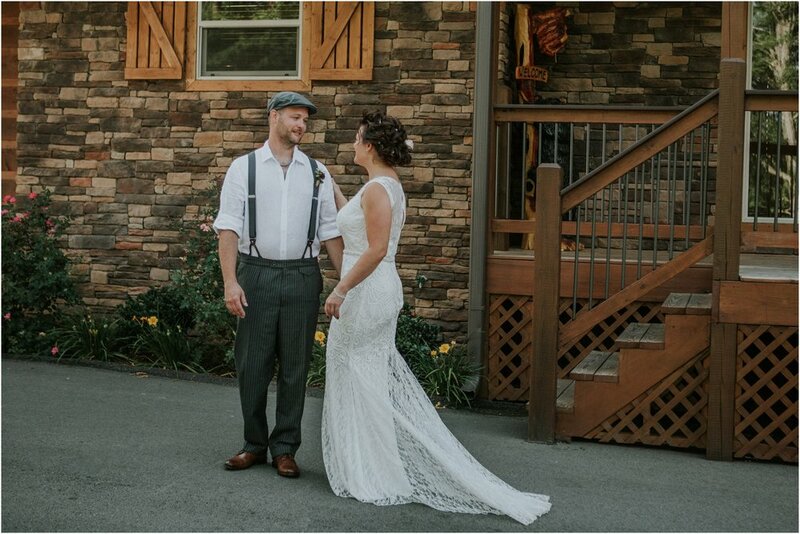 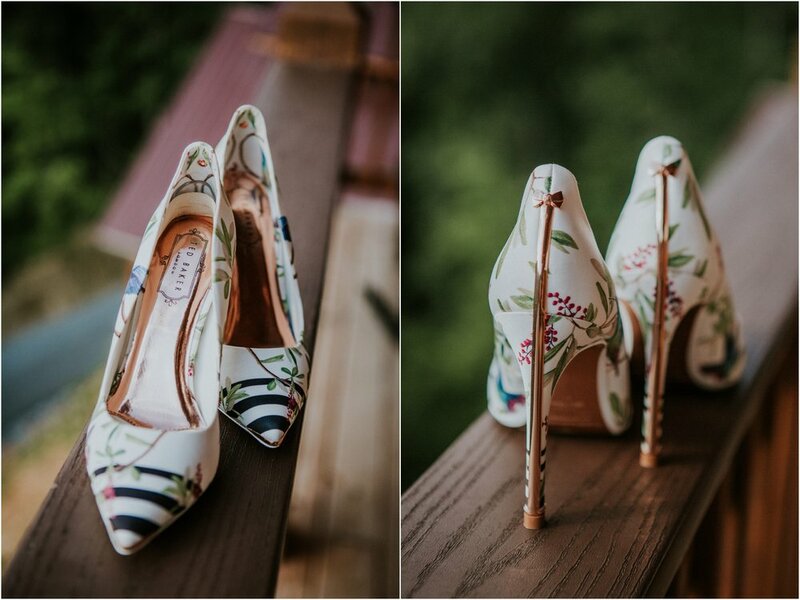 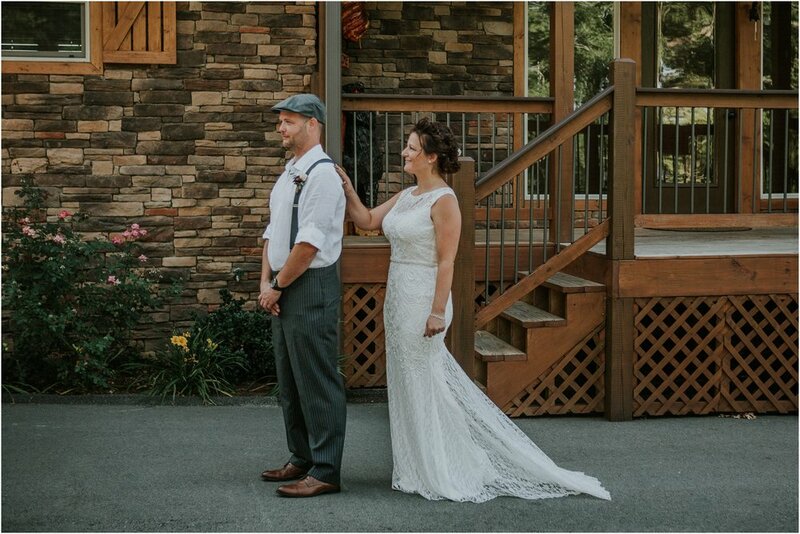 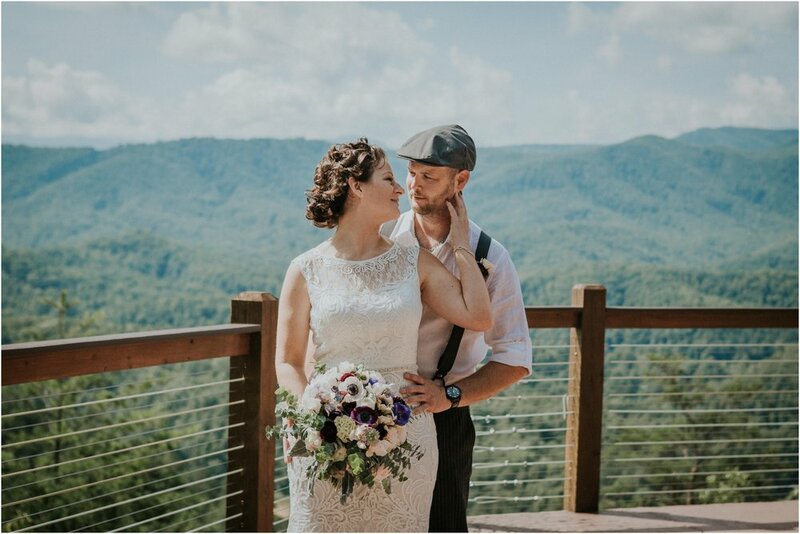 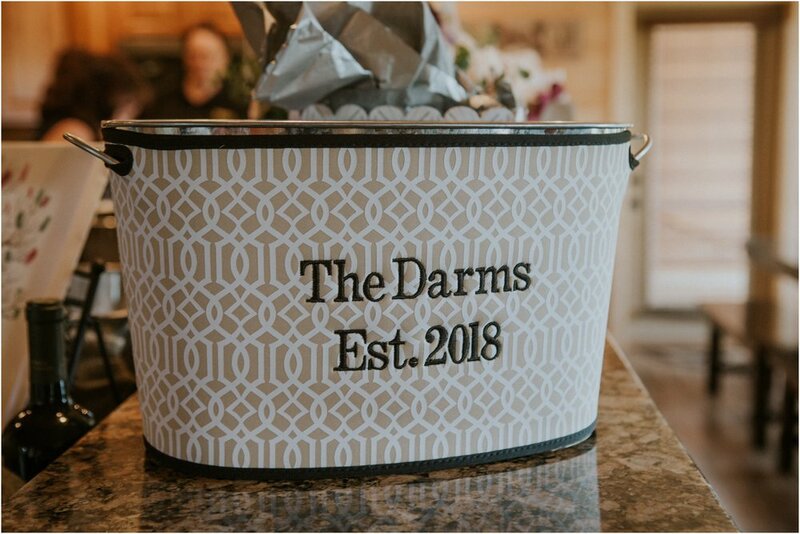 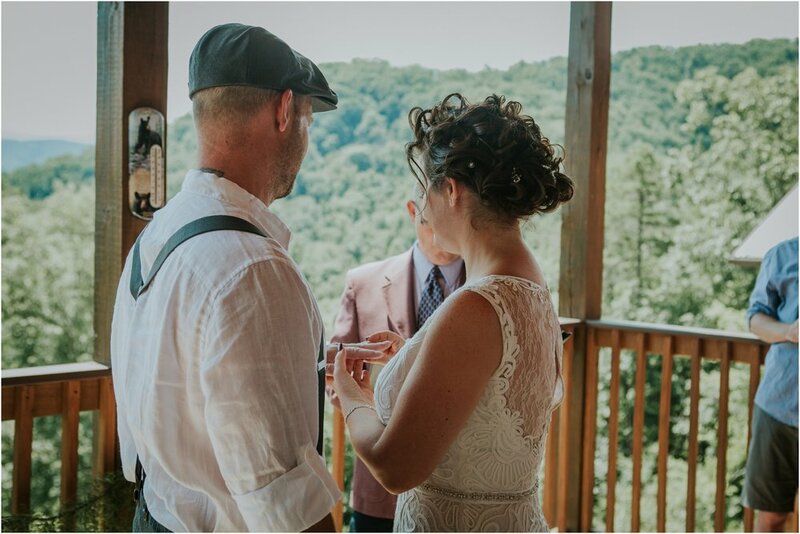 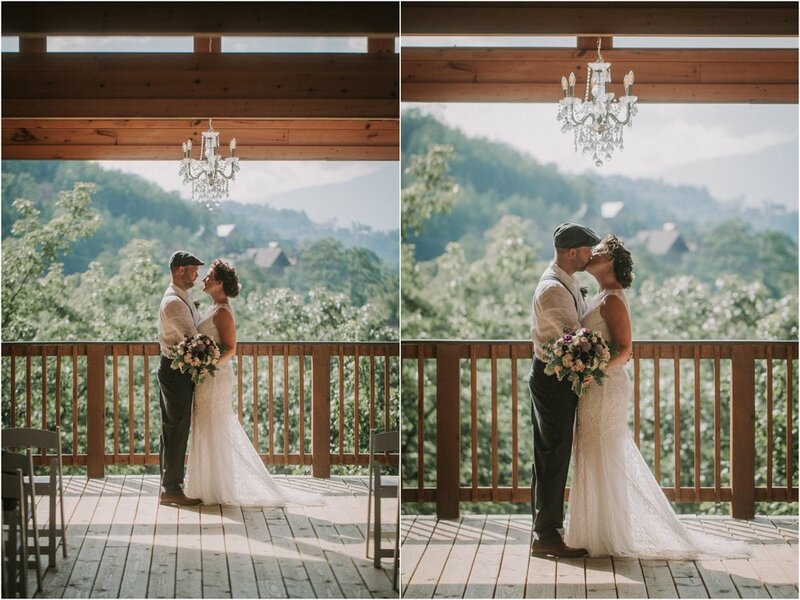 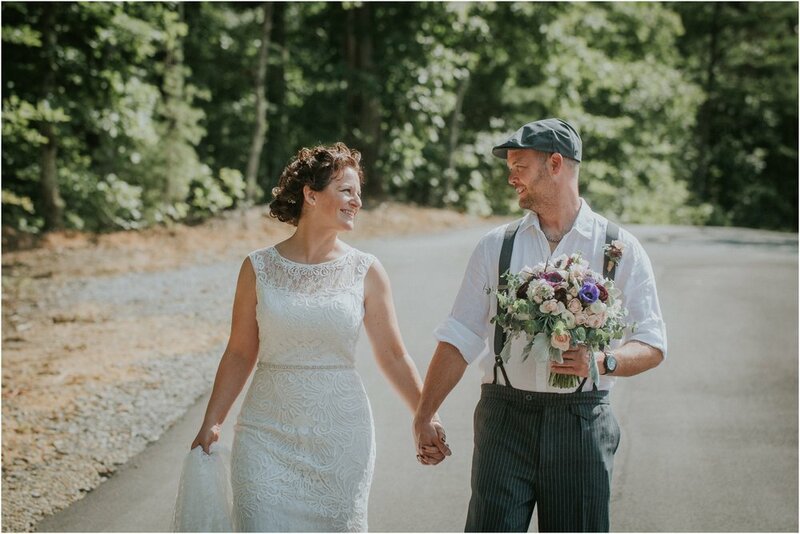 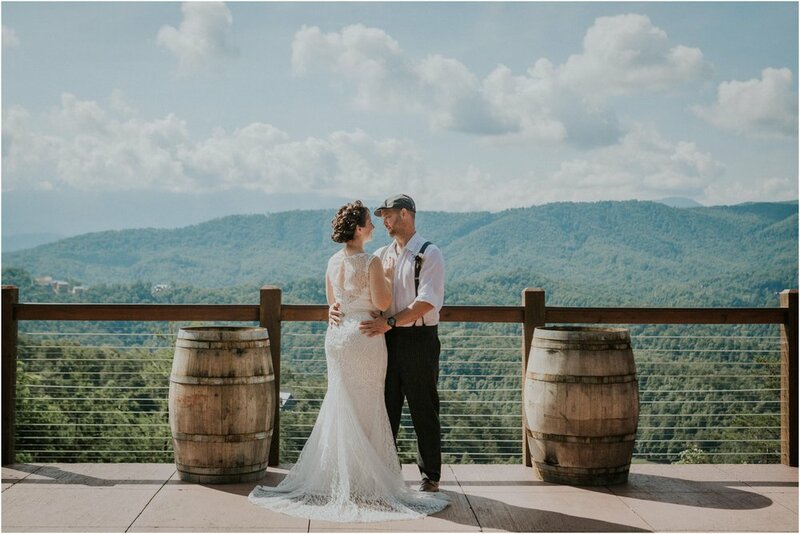 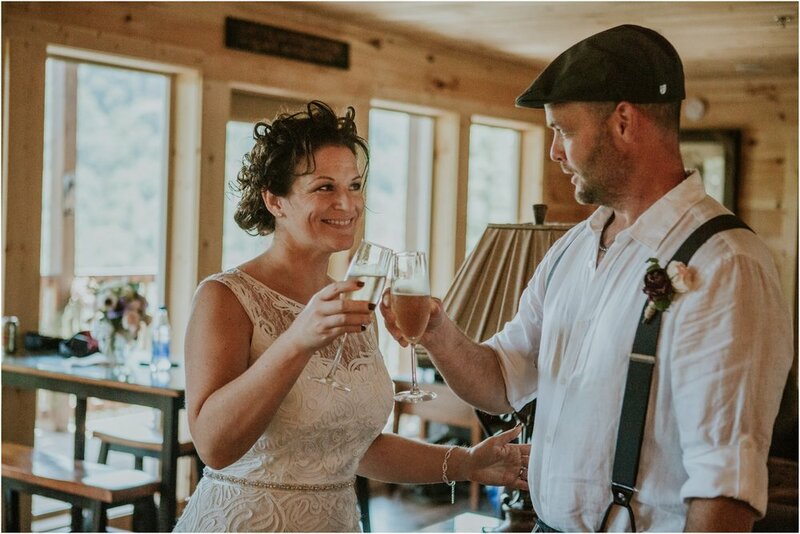 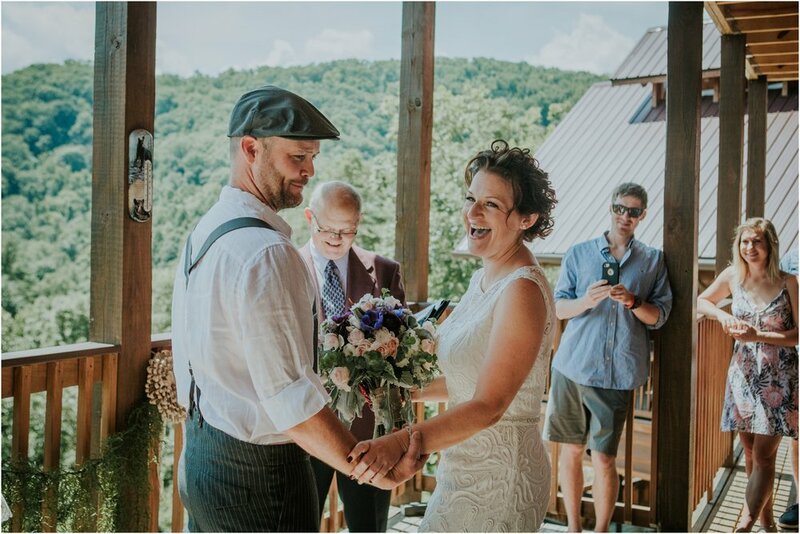 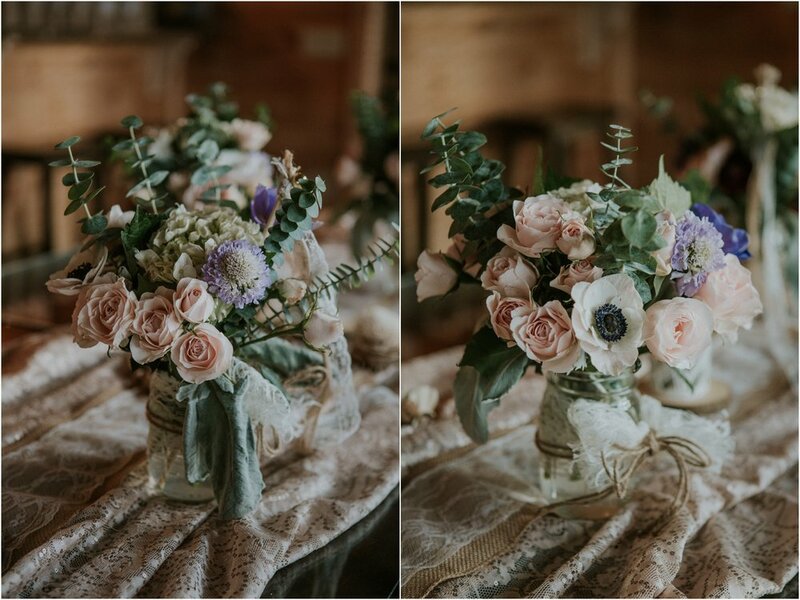 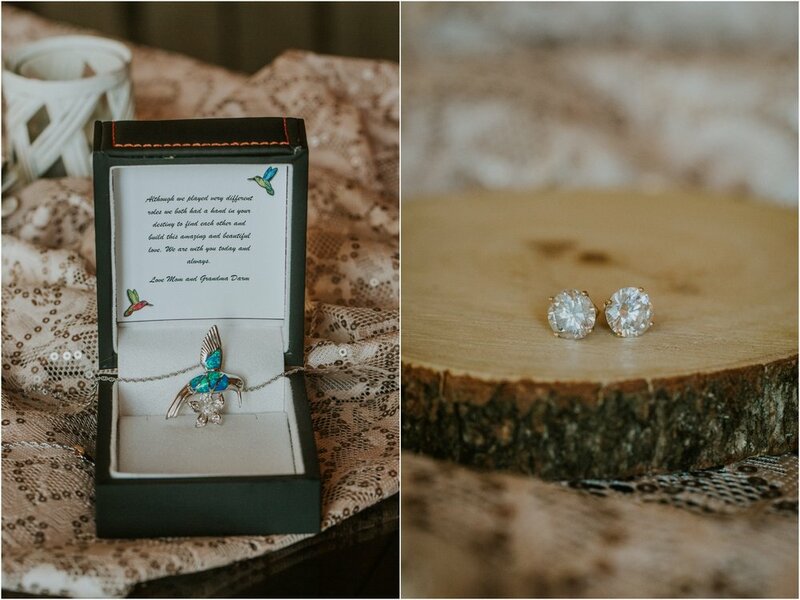 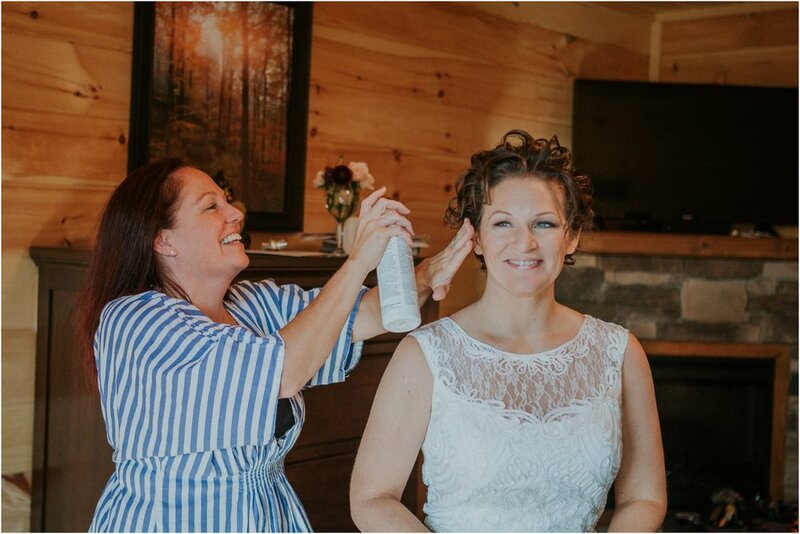 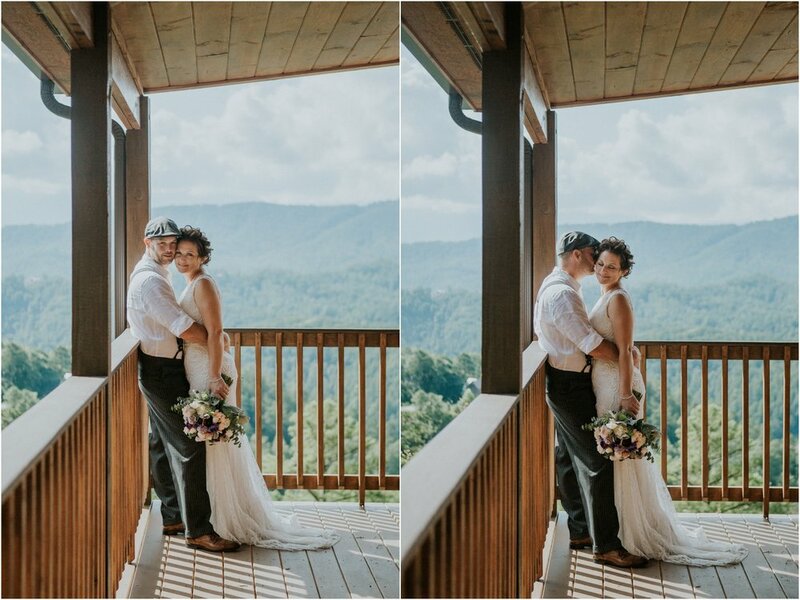 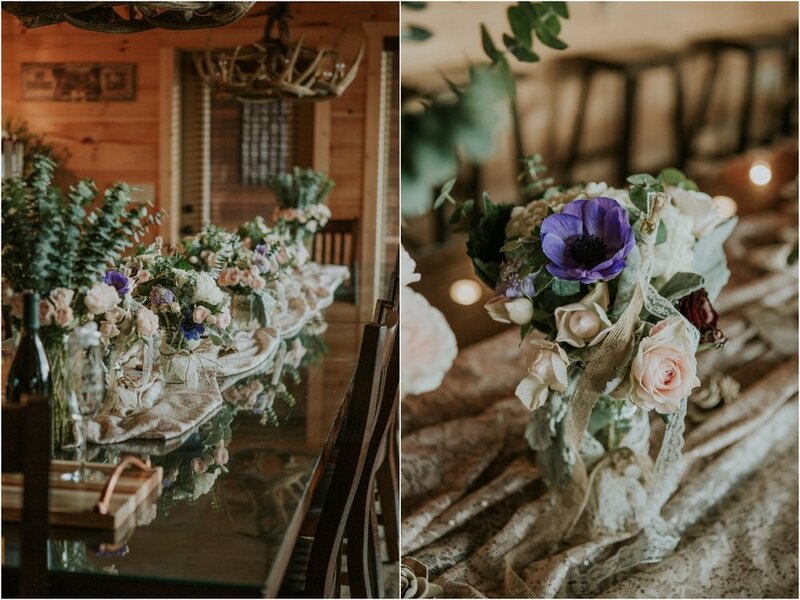 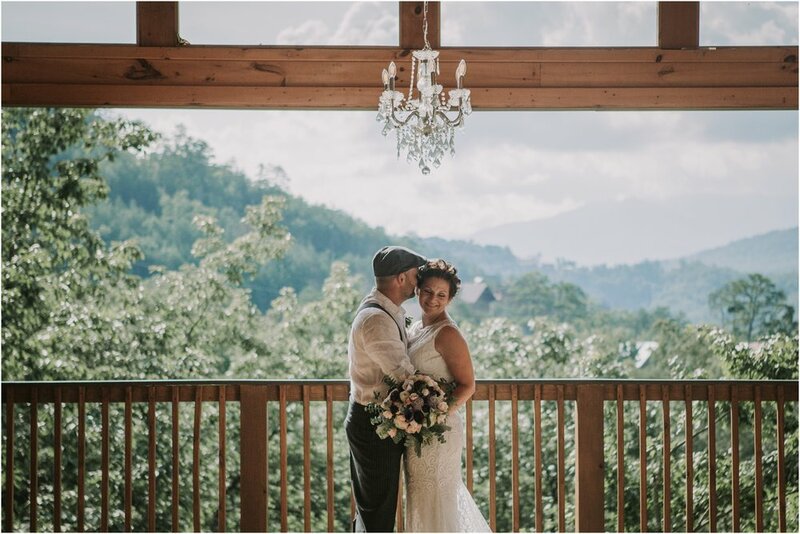 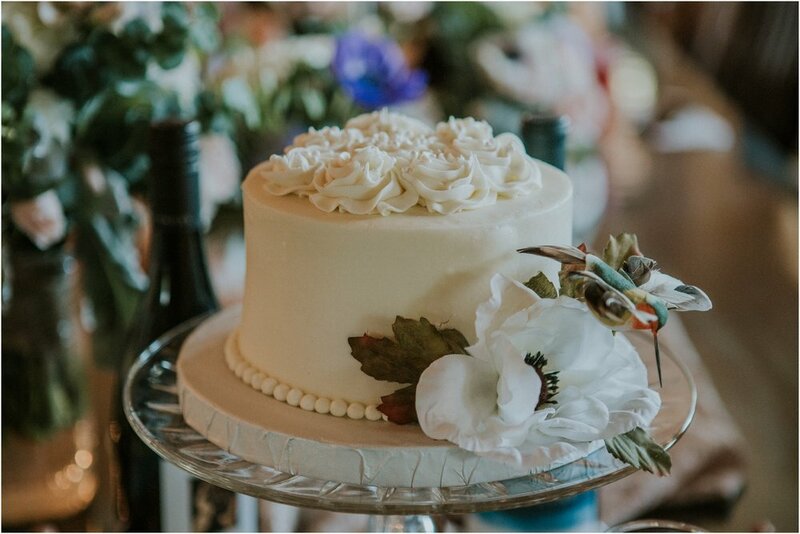 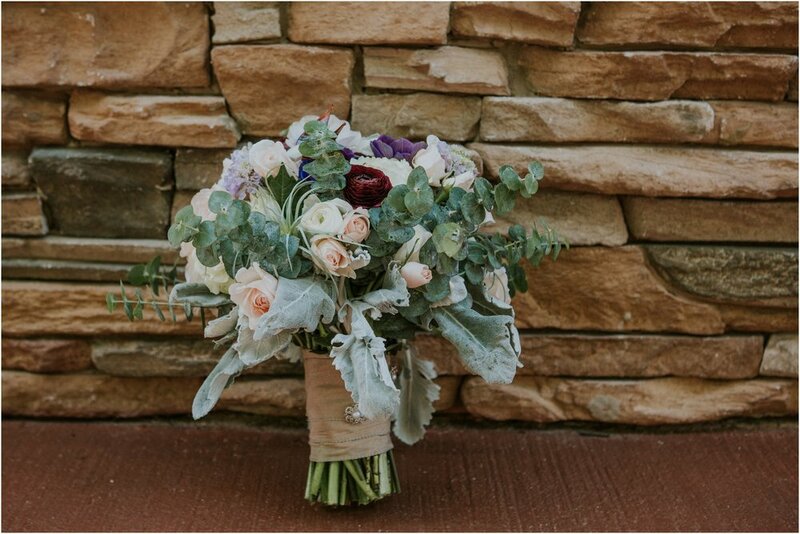 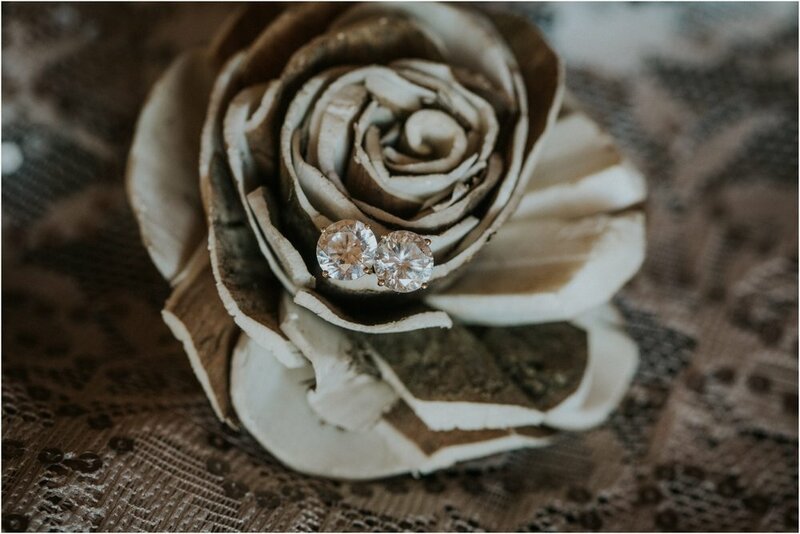 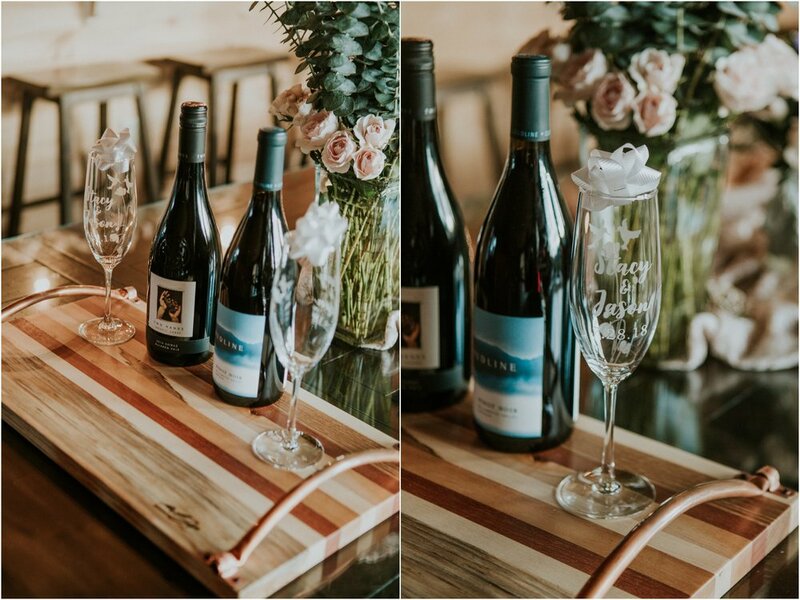 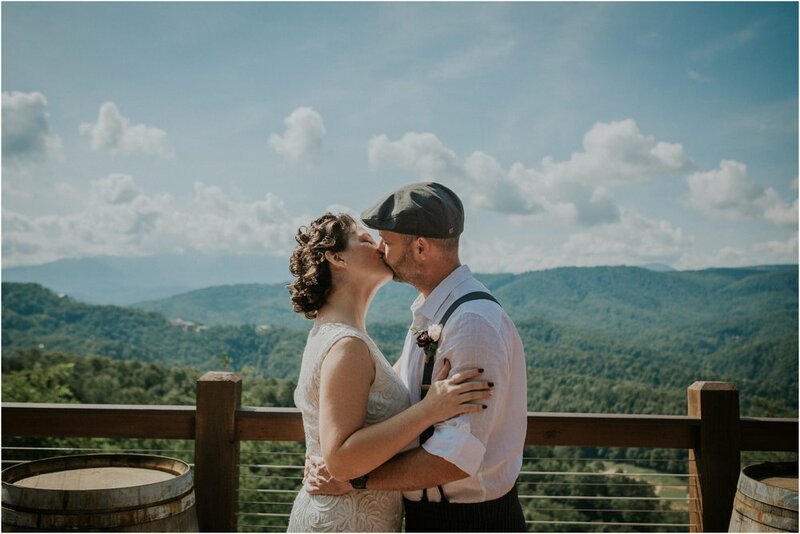 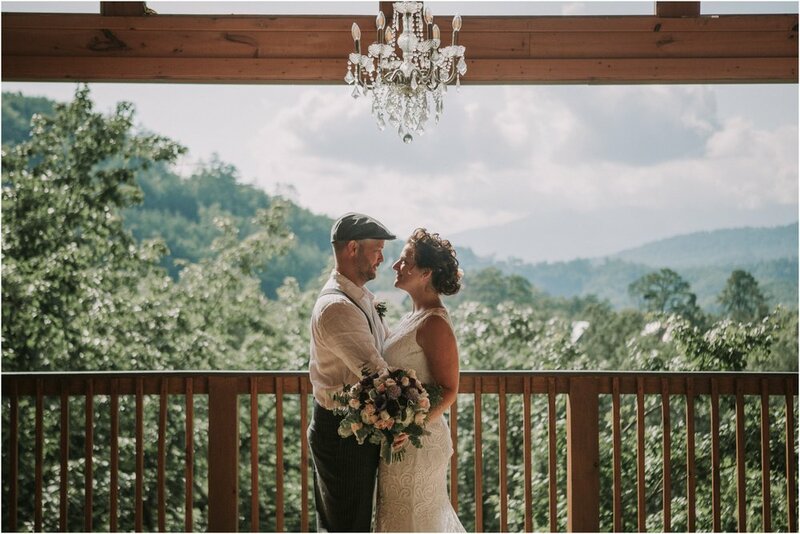 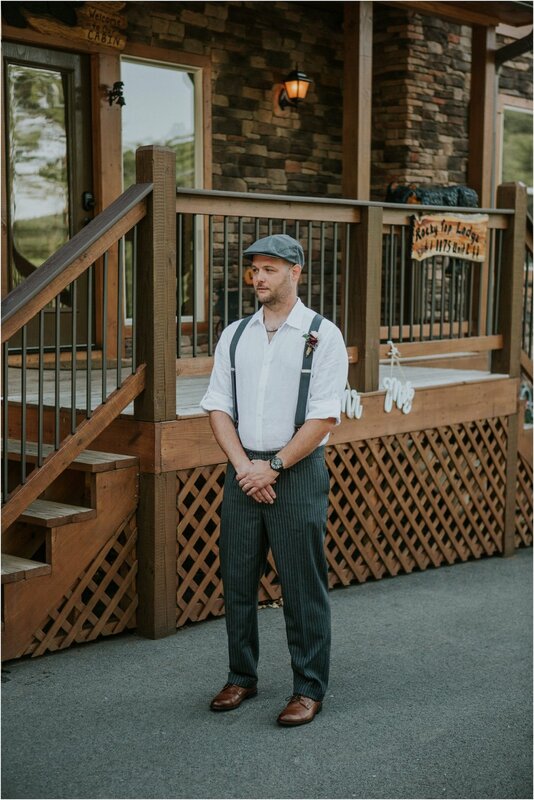 They rented a huge cabin at Parkside Resort, on the outskirts of Pigeon Forge, for their family and closest friends to come along and witness their wedding! 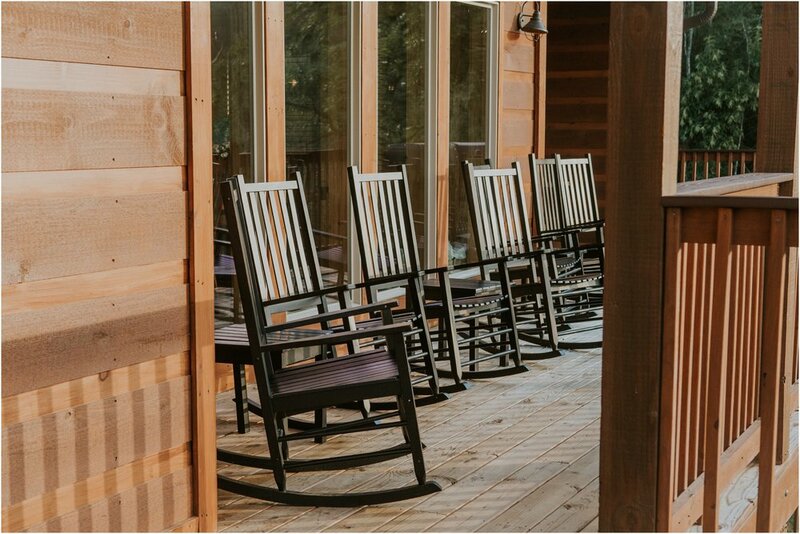 I loved that the whole family stayed either in their cabin or rented other cabins on the Parkside property. 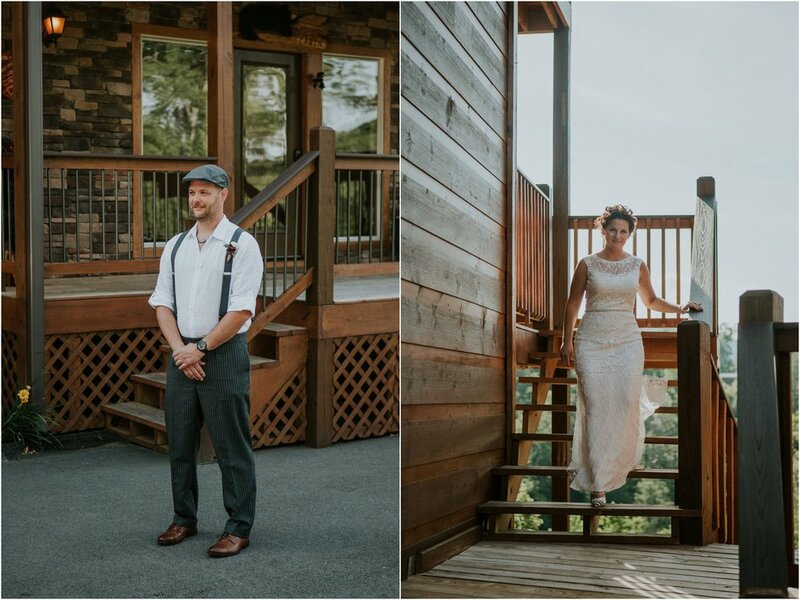 Rocky Top Lodge- their cabin- had four floors, and three floors had sweeping views of the mountains. 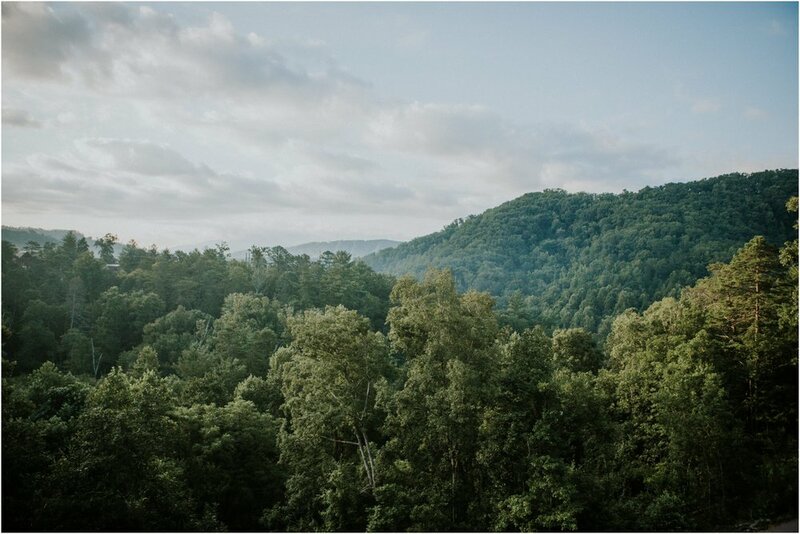 Talk about a dreamy place to stay! 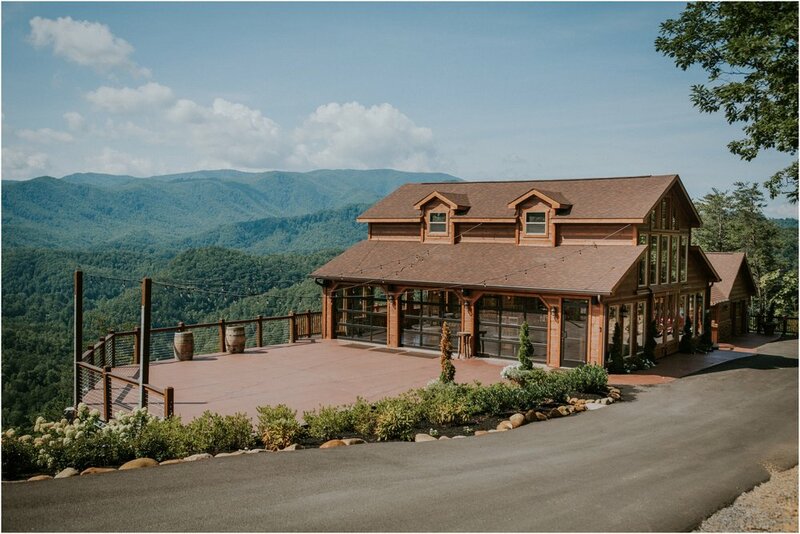 I could totally just live there full time! 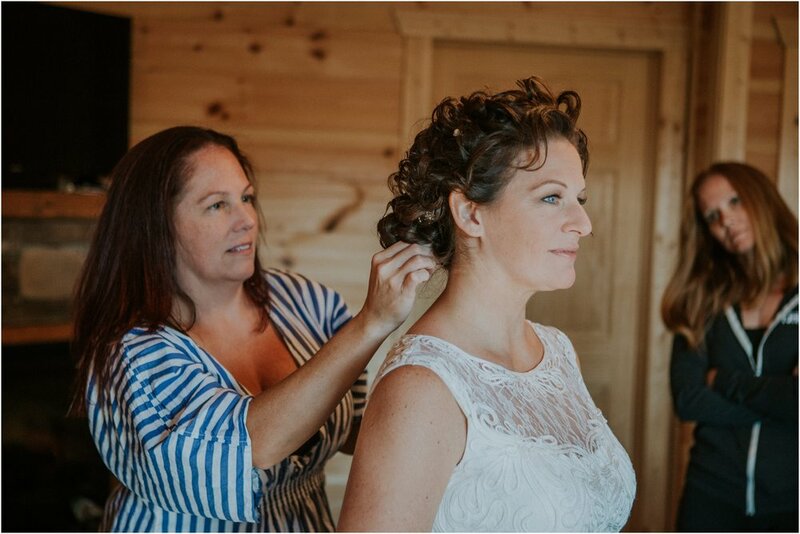 I arrived early in the morning to find Stacy and her friends in her room, doing Stacy’s hair and helping to get everything ready for the big day. 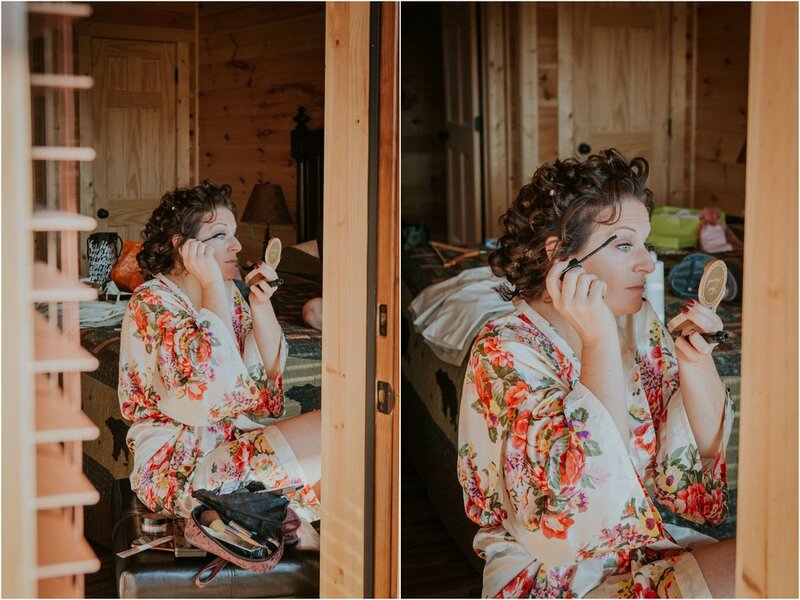 After her hair was complete, Stacy sat down in front of the window and started on makeup. 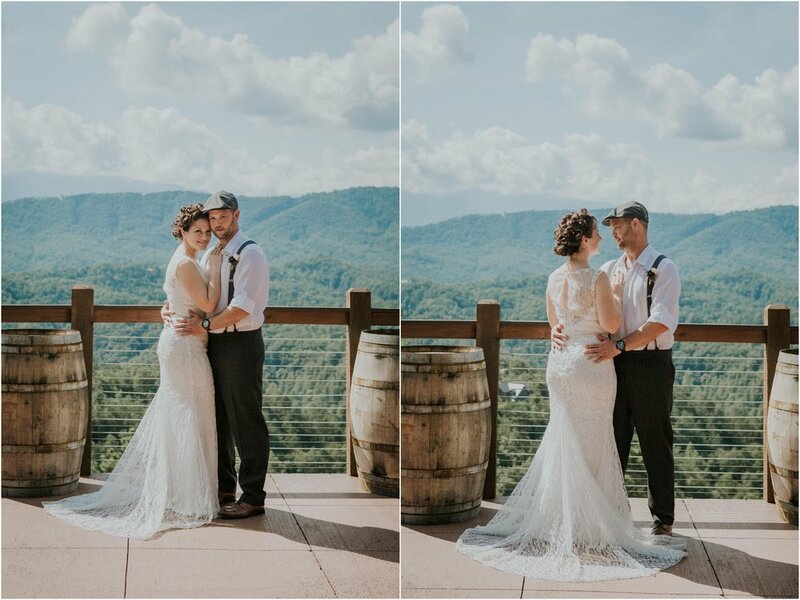 Next came the dress! 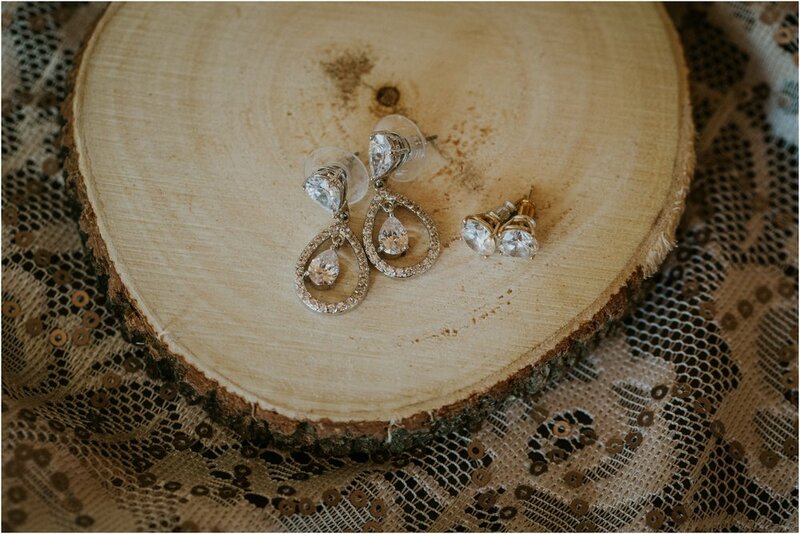 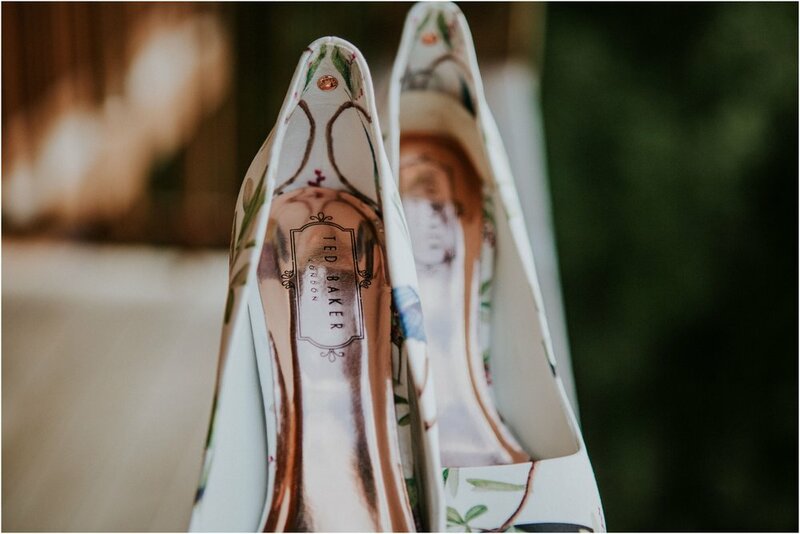 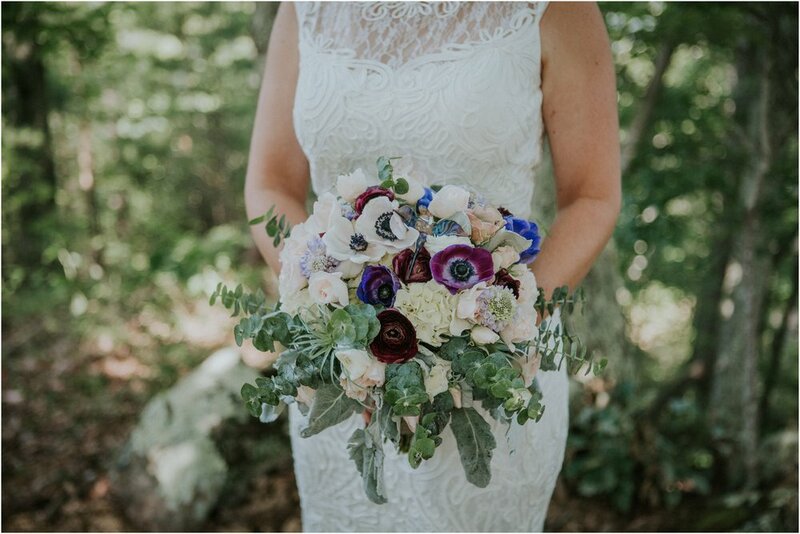 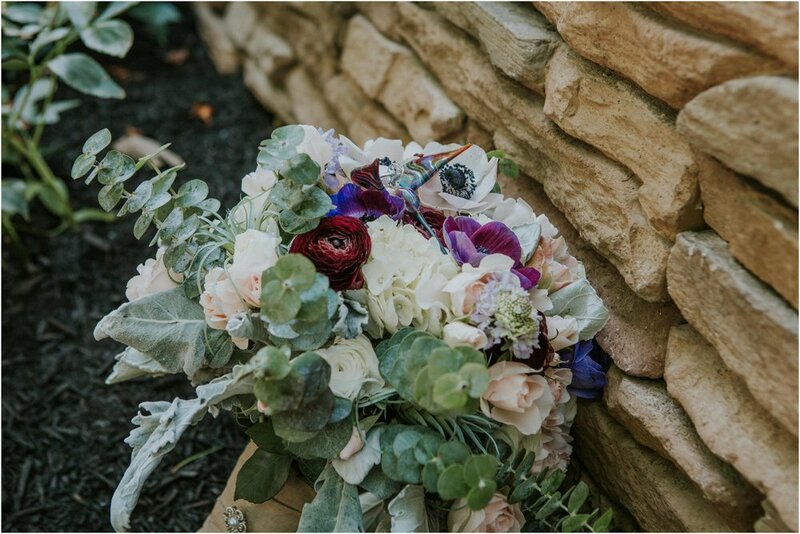 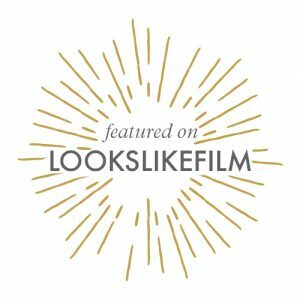 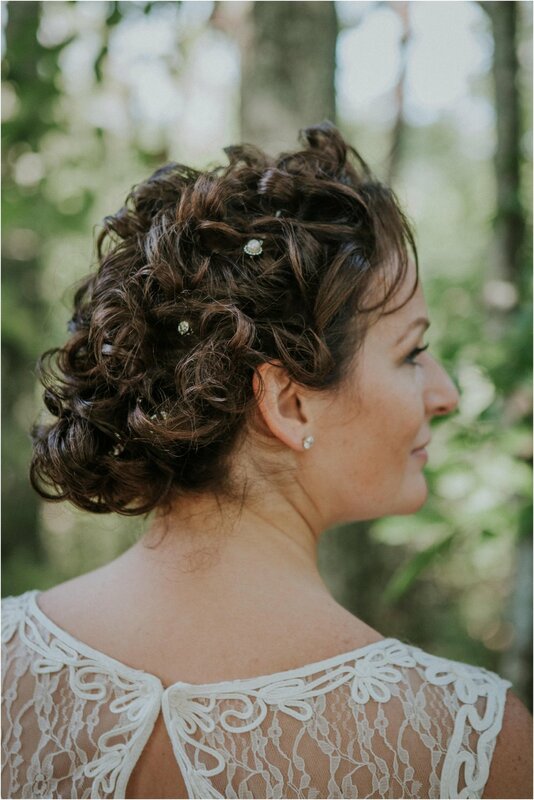 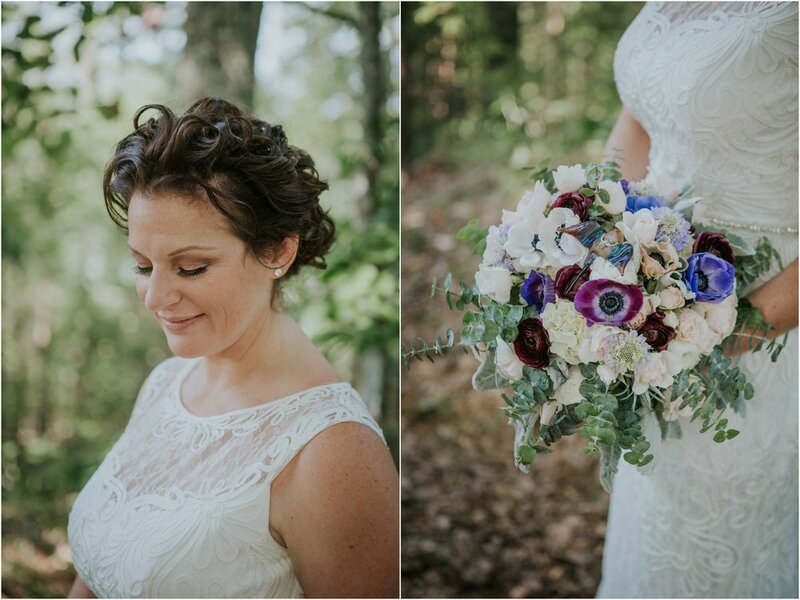 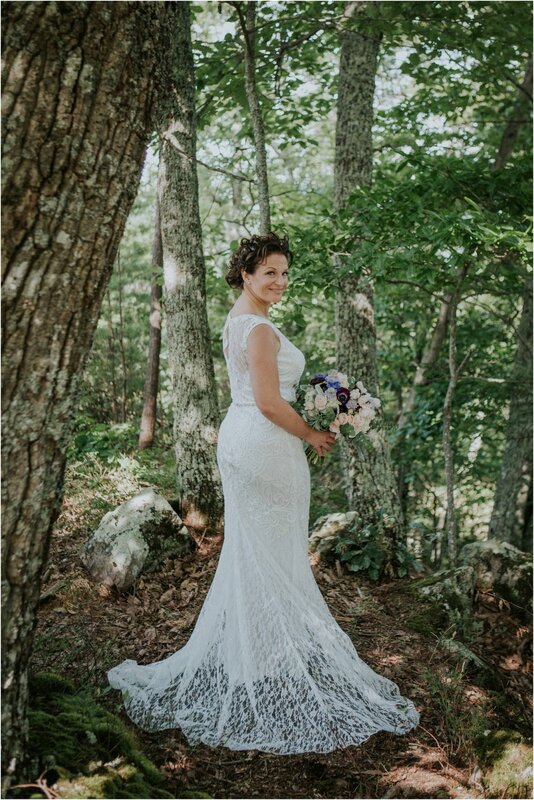 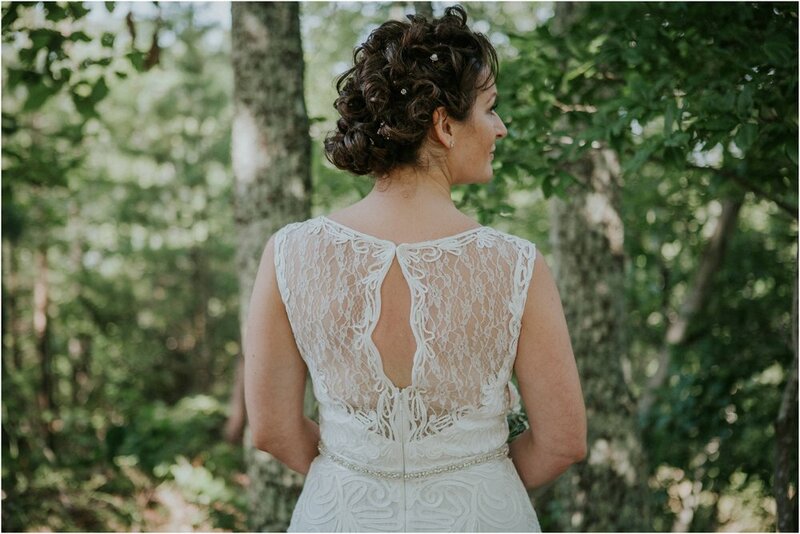 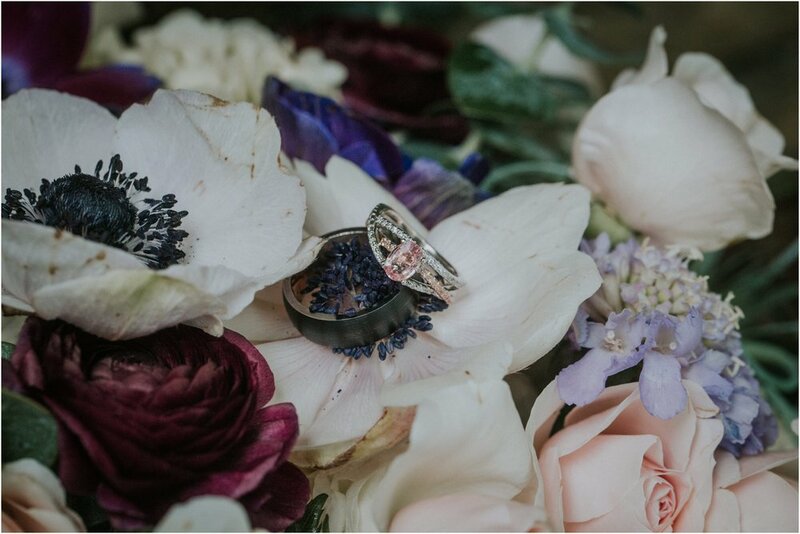 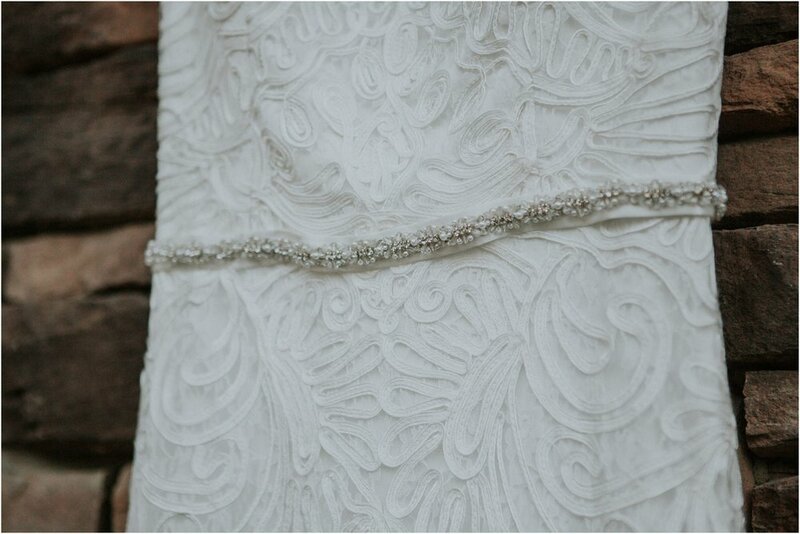 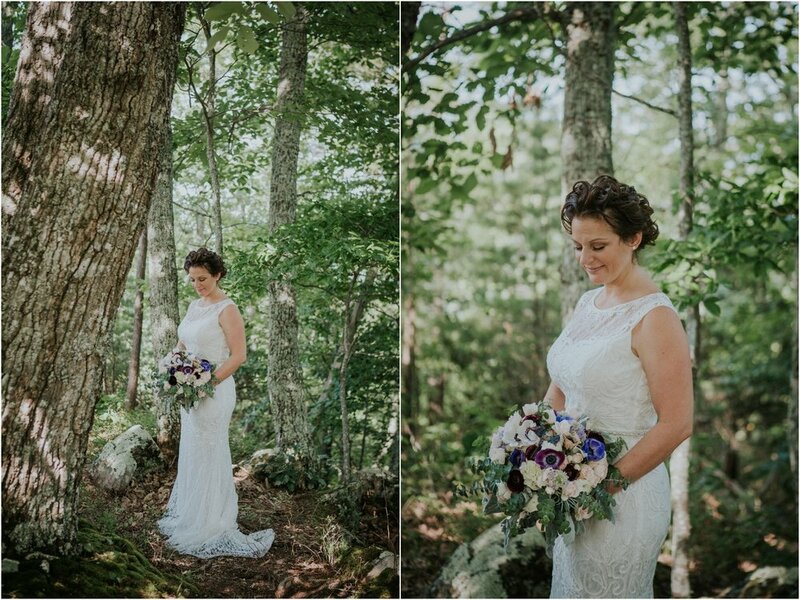 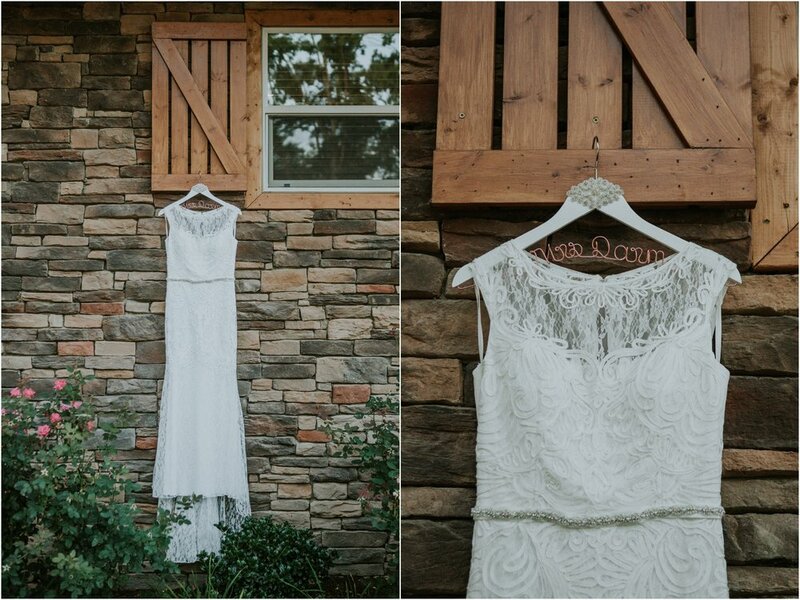 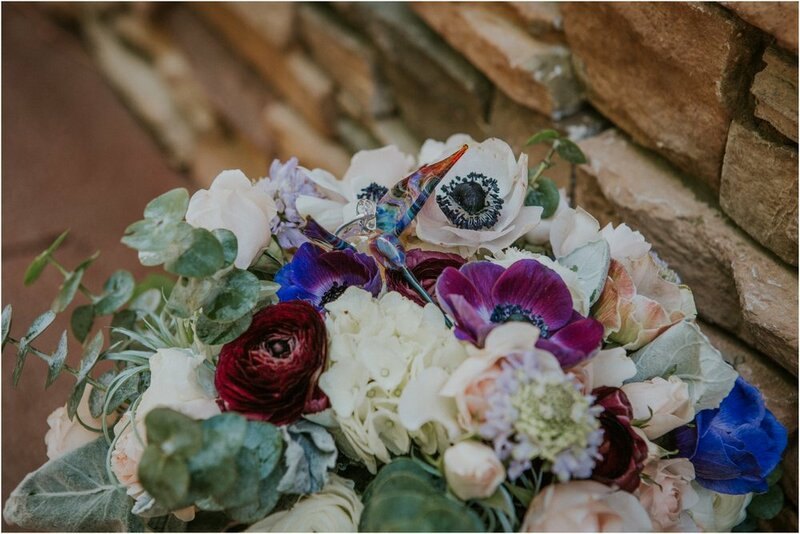 I LOVED Stacy’s dress with it’s unique design and detailing— it was gorgeous and perfect for their wedding day. 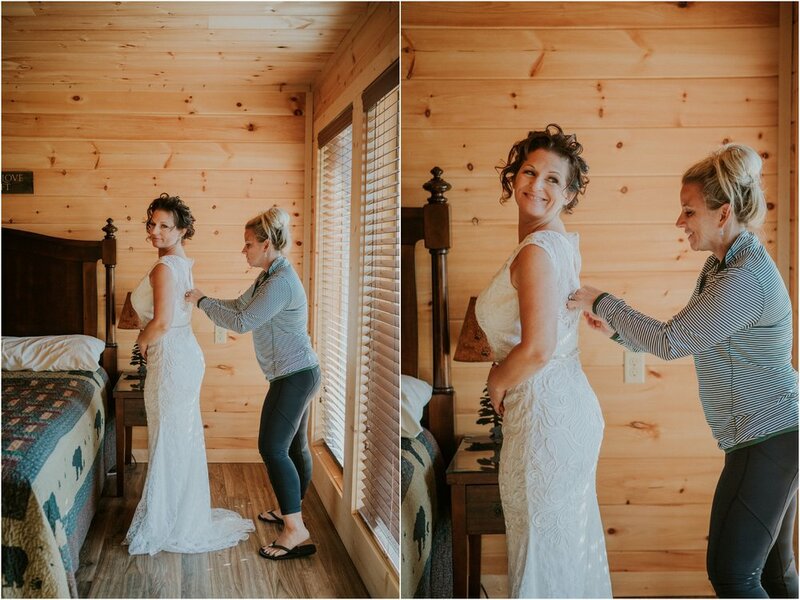 Once Stacy was ready, we headed downstairs for the first look. 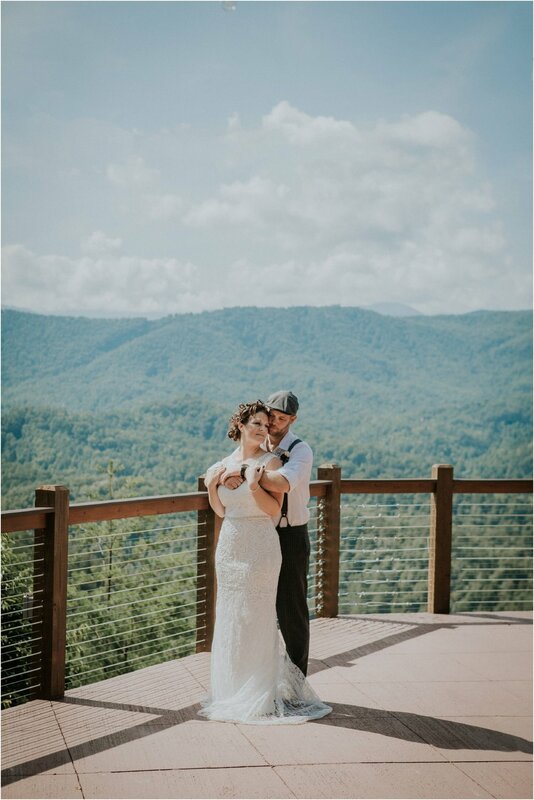 This is when things took a **slight** tumble (foreshadowing and puns). 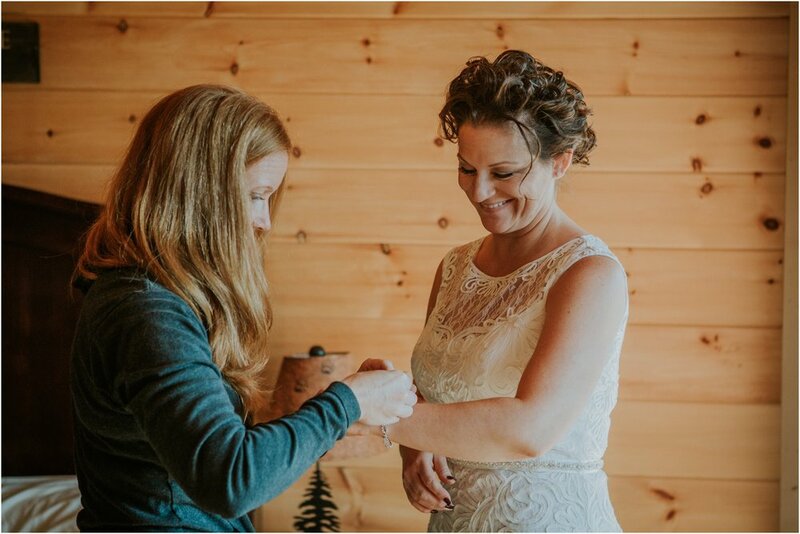 I truly hope that Stacy doesn’t mind me sharing, but I think we both look back and just giggle that it actually happened. 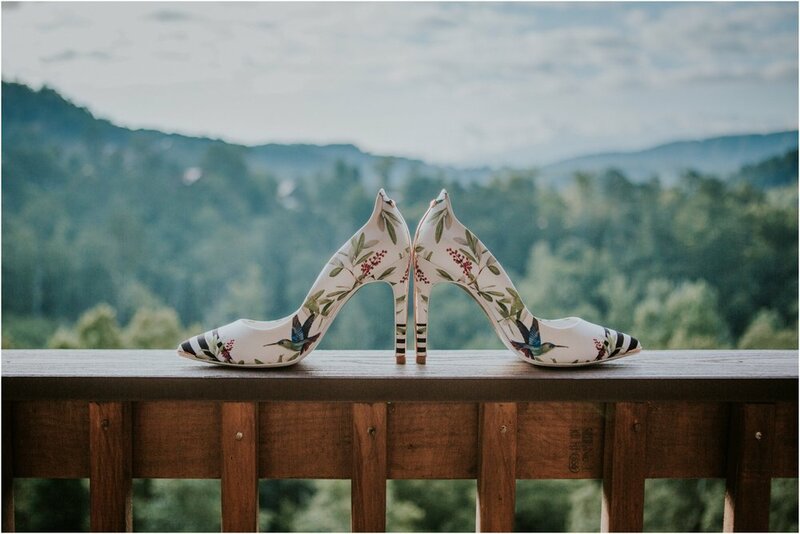 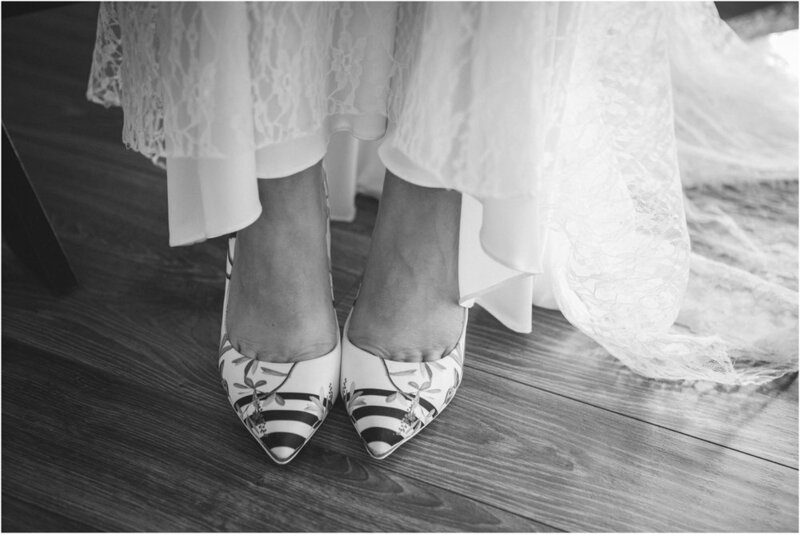 As Stacy came down the stairs of the porch to meet Jason, her heels caught the lace train of the dress, sending Stacy for a tumble down the stairs. 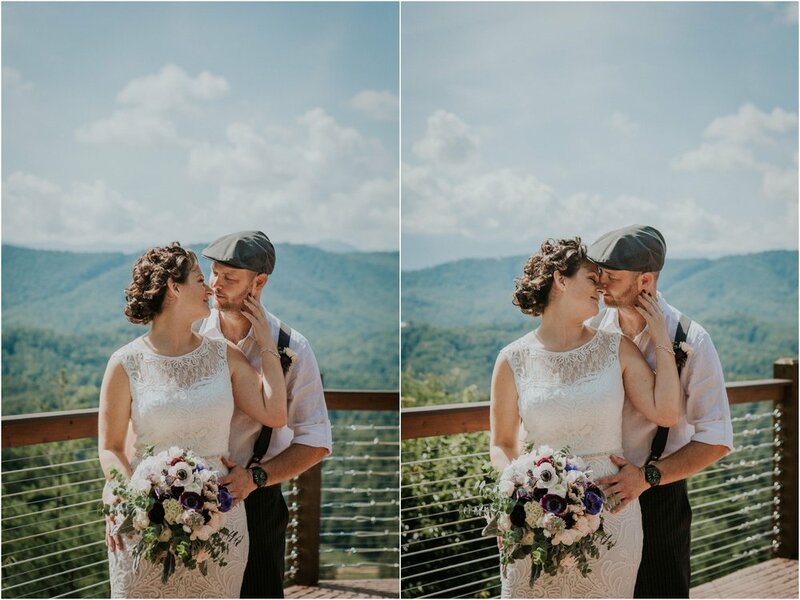 It happened so fast that all I could do was stand there in shock! 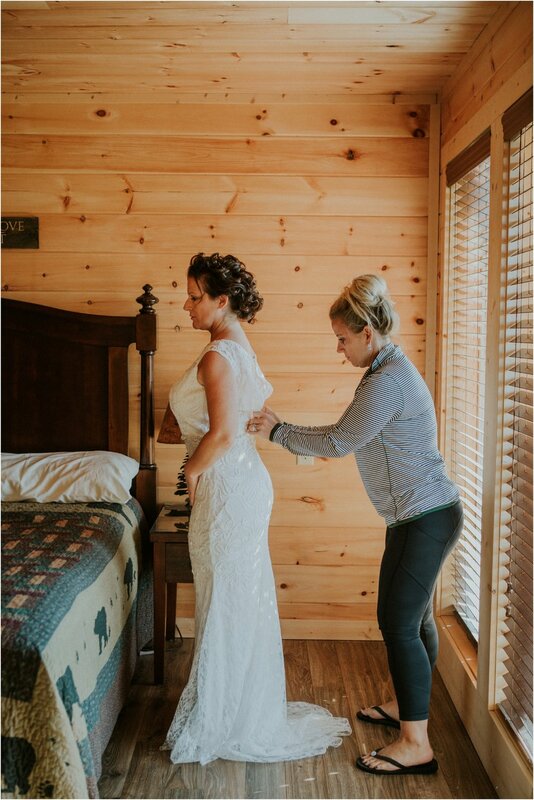 I ran over to Stacy as fast as I could and asked if she was okay and all she said was, “Is my dress okay?! 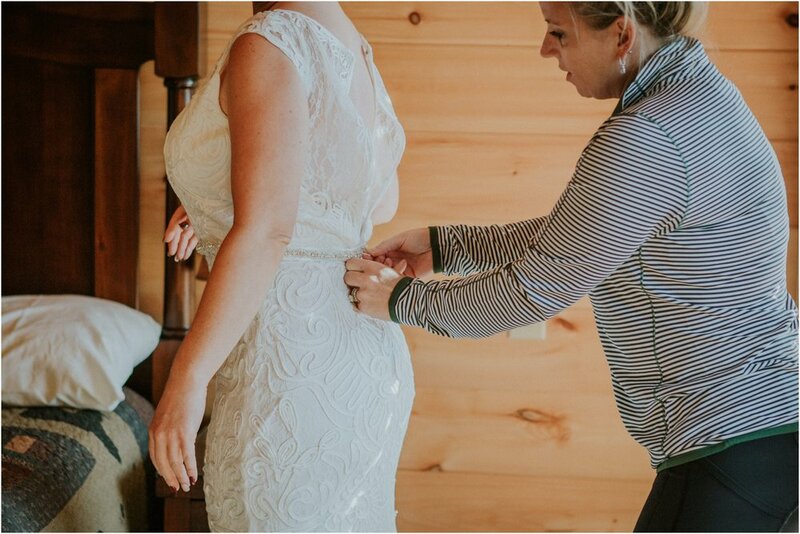 ?” I looked it over and said, “Yes, it’s fine, but what’s more important- are YOU okay? 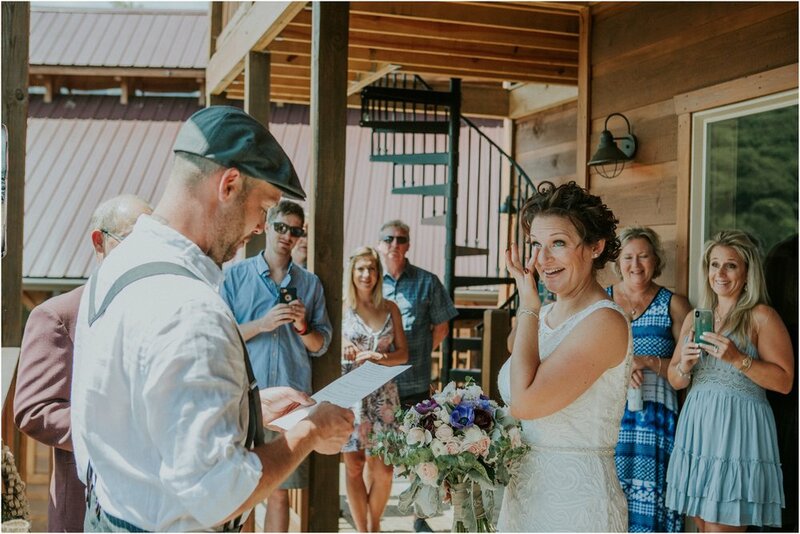 !” We laughed hysterically as I picked some mulch out of the train. 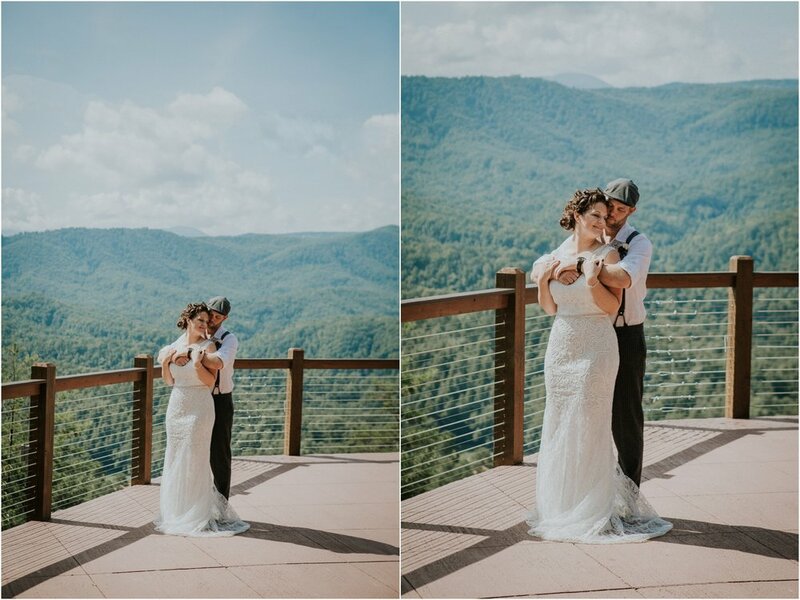 Later on, she ended up asking, “Did you at least get a PHOTO of me falling? 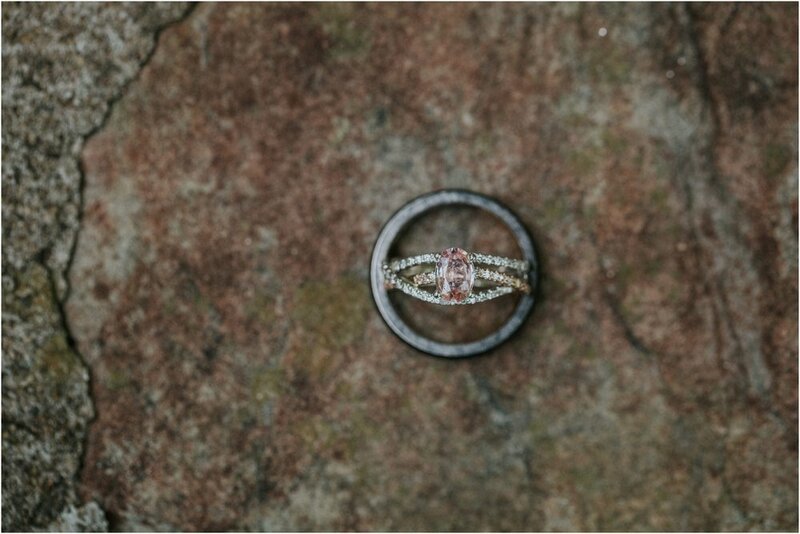 !” I told her, “No way! 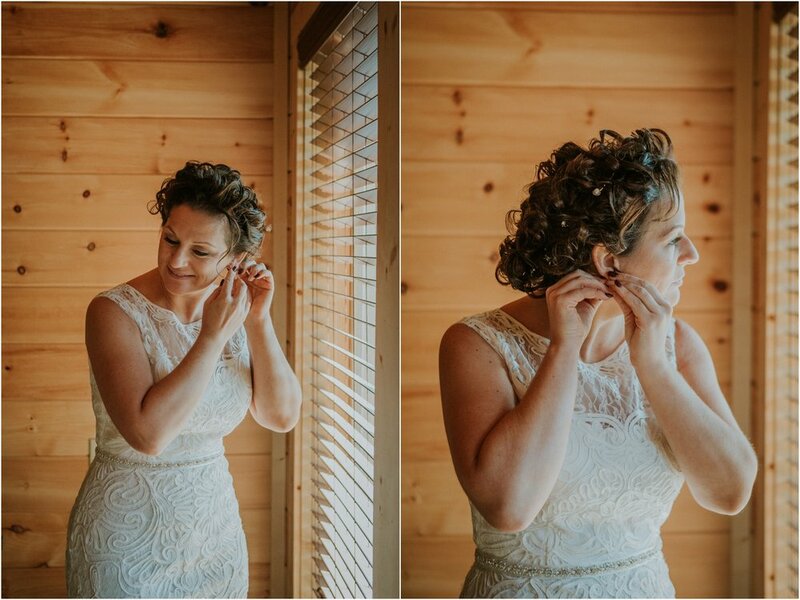 It happened so fast and I was more worried about you!” I love that Stacy just laughed it off the entire day- you can’t even tell in the photos that anything happened! 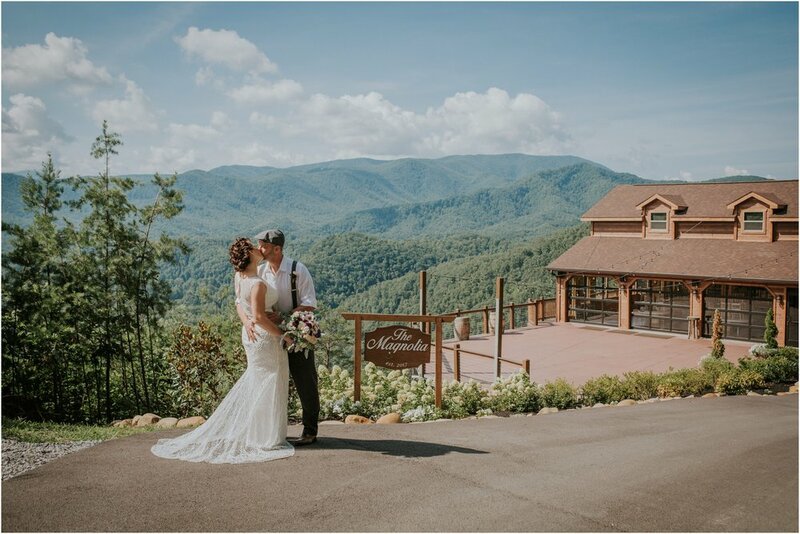 Stacy met Jason in front of Rocky Top Lodge for their first look. 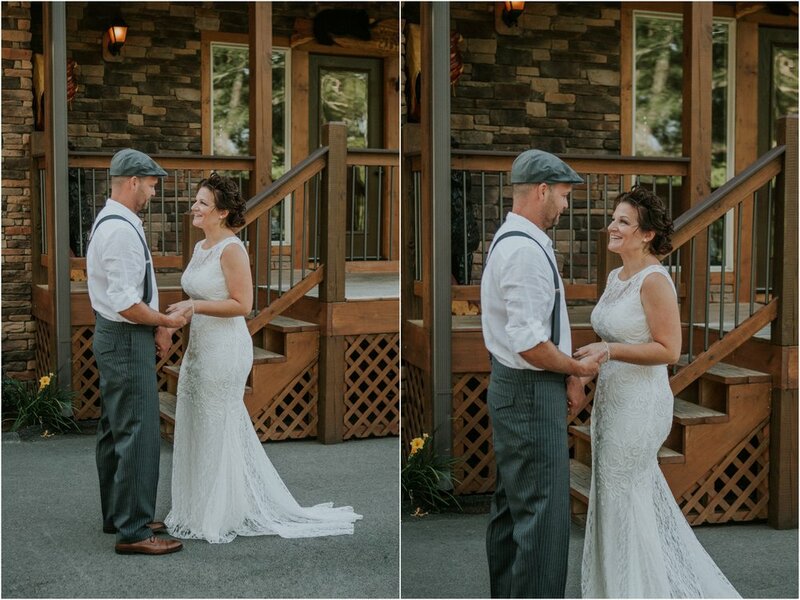 His smile said it all! 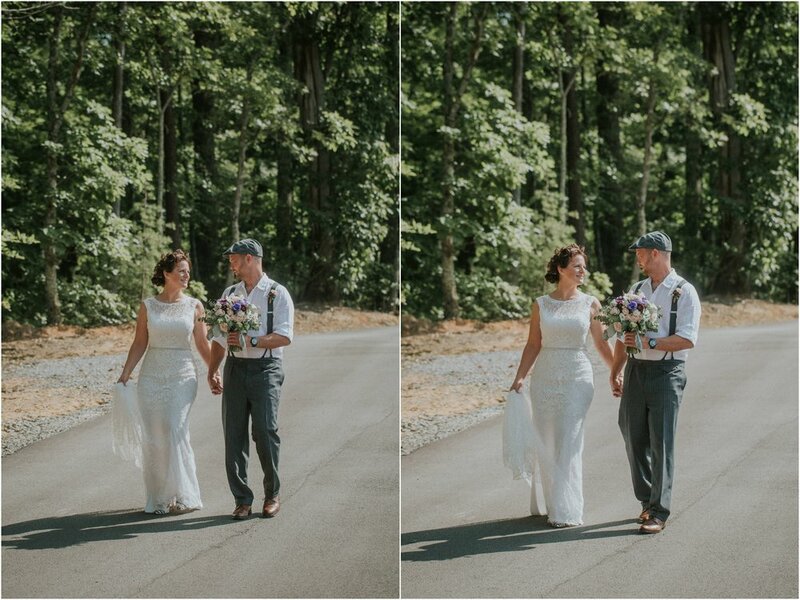 We then drove over to the Magnolia Venue for some couple’s portraits. 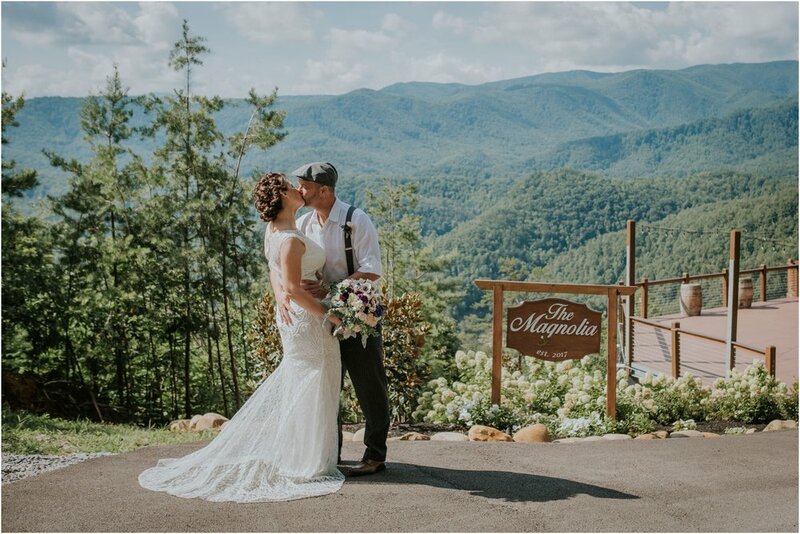 The view from the Magnolia is just breathtaking and there was nothing but blue skies, puffy clouds and sunshine! 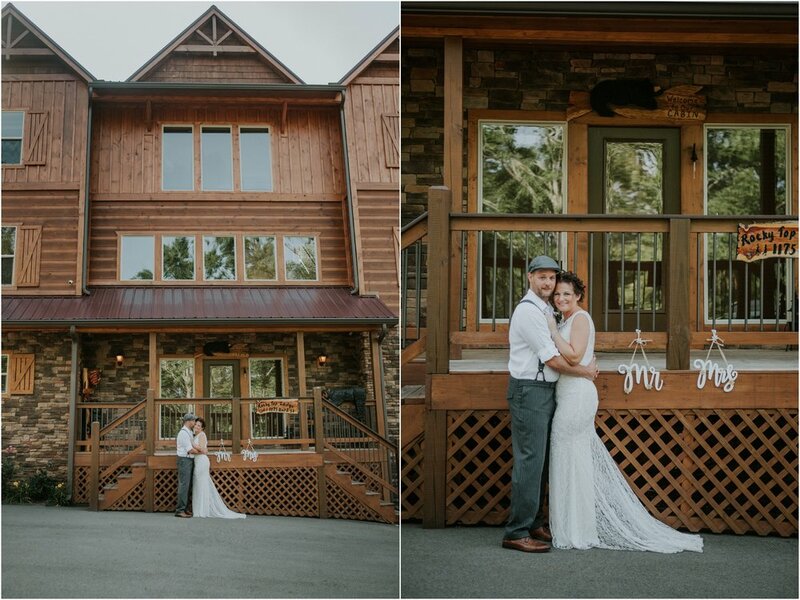 When we arrived back to Rocky Top, all of Jason and Stacy’s family and friends were waiting at the lodge and were so excited to see them both! 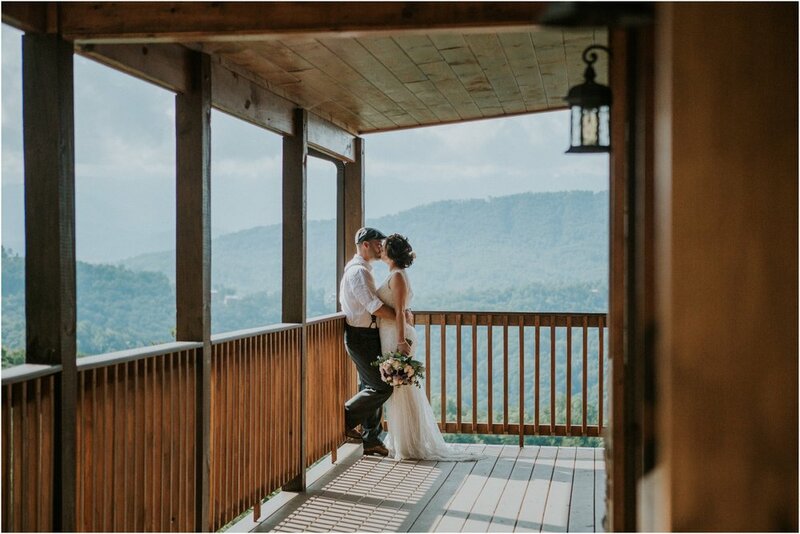 After family portraits, we all gathered on the main level porch for their intimate ceremony overlooking the Smokies. 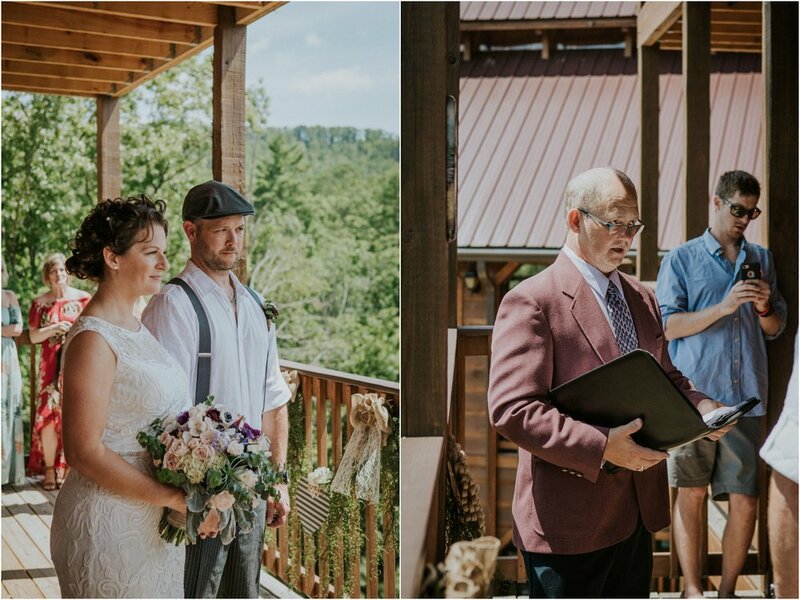 Jason’s dad officiated, making it incredibly special. 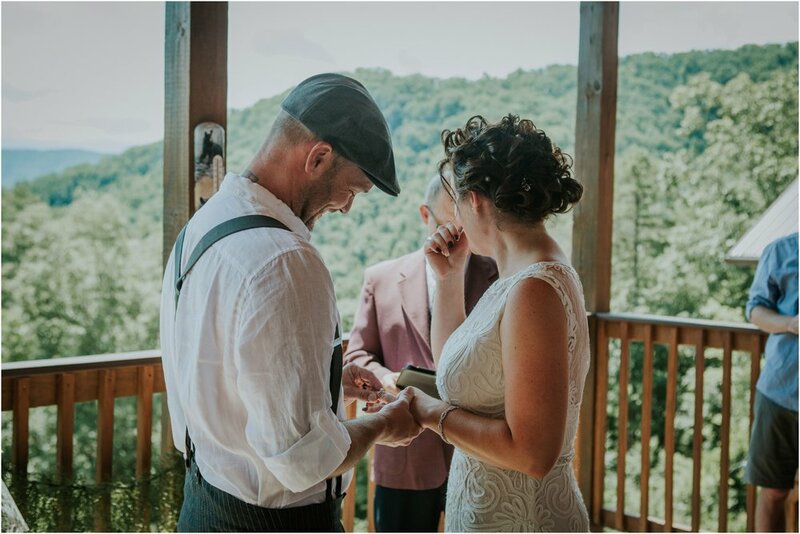 There were tears of joy and laughter as they read their own vows to each other. 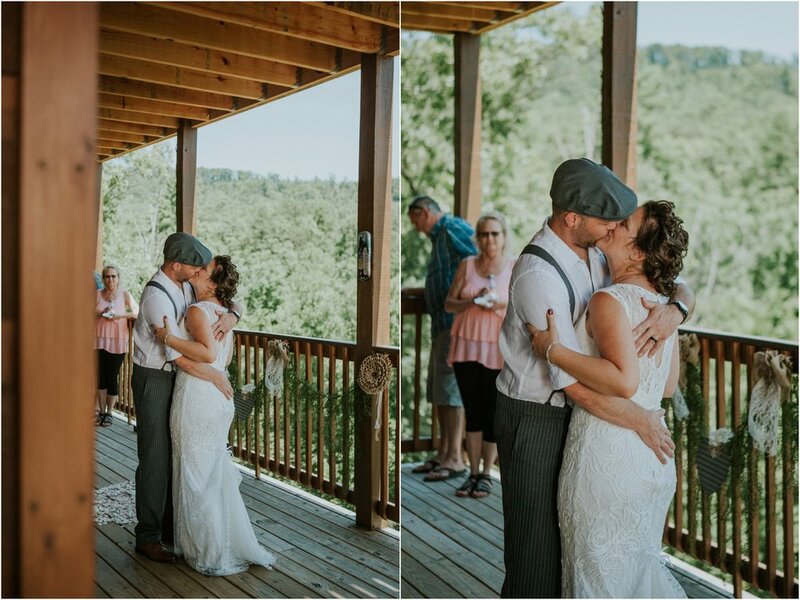 After the first kiss, Jason and Stacy were finally husband and wife! 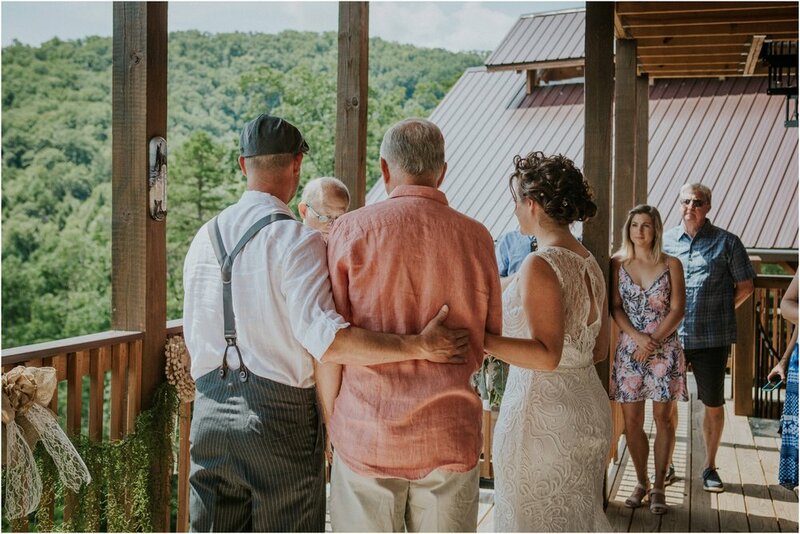 We then gathered in the great room for barbecue and beverages to celebrate! 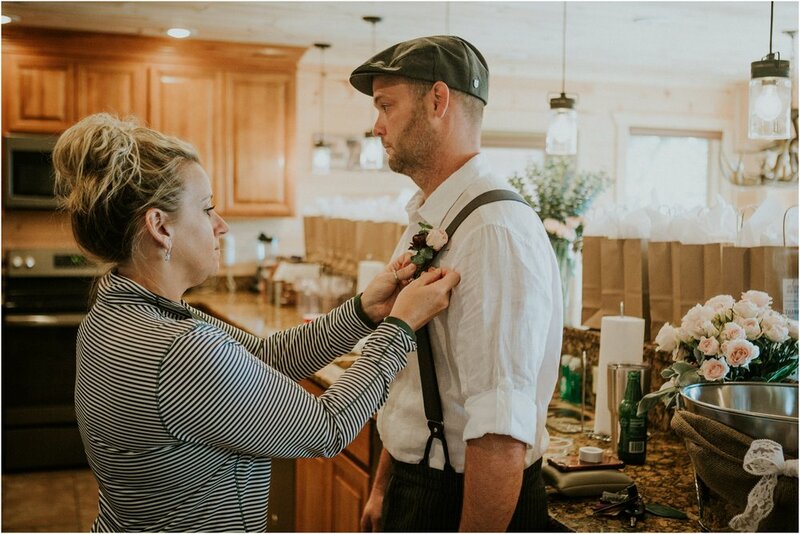 Stacy and Jason- - you two are just so perfect for each other. 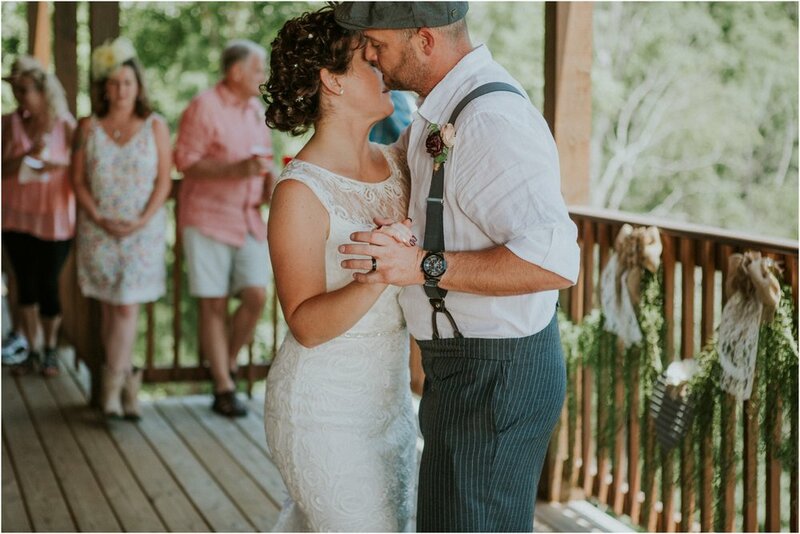 I can see in your eyes the love you have for each other. 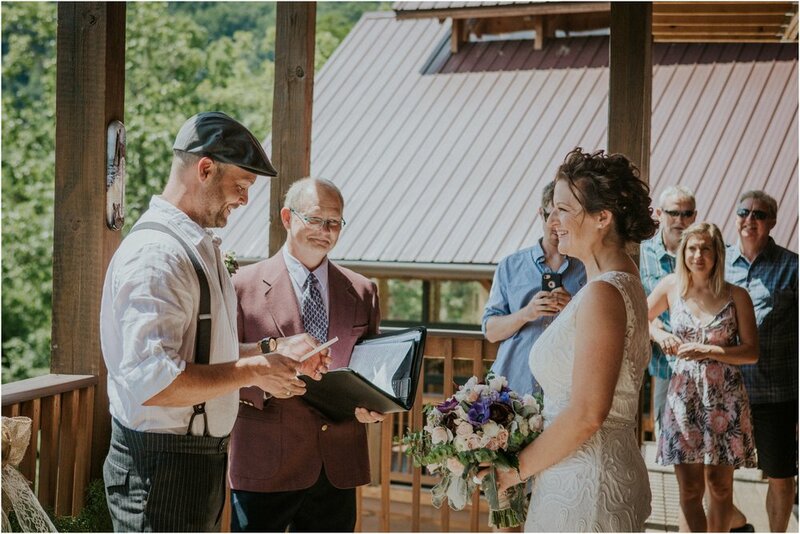 I am so glad that you traveled down to Tennessee for your special day. 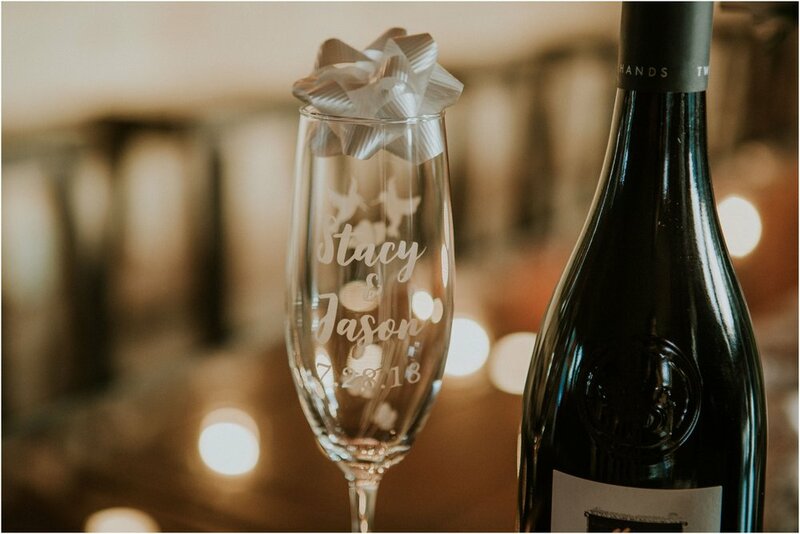 Congratulations and cheers to your next adventure! 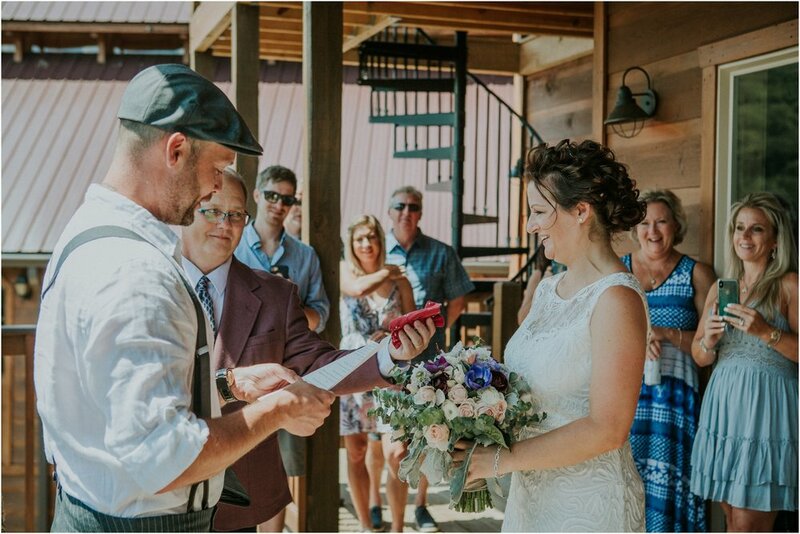 Huge thanks to all of Stacy and Jason’s vendors who made their day amazing!